It is said that constantly learning new things is a possible deterrent to Alzheimer’s disease. (I’m not so sure about this as no one kept his brain more active than my father, and he succumbed at a very young age to that dread disease.) Anyway, if it’s true, I probably earn myself at least another un-befuddled year as a side benefit of coming to Mexico as I am learning by the minute every day I’m here. 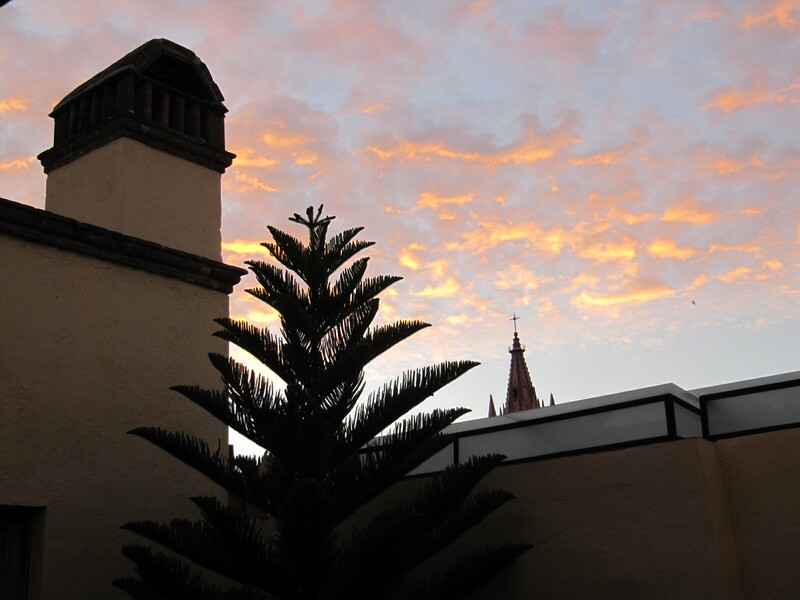 In just a few days after arriving in San Miguel de Allende (SMA), Mexico, on Dec. 1, 2010, I have mastered two remote controls, one for the TV and one for the DVD so I can play my yoga tape each morning; have learned how to light and extinguish the two gas fireplaces without shutting off the pilot light; have figured out the myriad keys required to get into the “compound” (of two houses) and into my house in particular, the shared laundry area, plus onto the three different outside sitting areas, each having its own key (and each turn of the key is counter-intuitive, except for the one or two that aren’t, and then there’s the question of is the key put into the lock right side up or upside down). I have figured out which switches turn on which lights and which fountains (well, I’m still working on that; you’ve never seen such a huge number of switches), and the minutiae of the working of the stove, washing machine, microwave, and all those other appliances we take for granted, but which are slightly different in each house. In my first six days here, I have dealt with the maid, Mari, solely in Spanish, who is amazing and lovely; with a rep of the property management company, Delfino, half in Spanish and half in English, also lovely, to troubleshoot a couple of things; with three different cable guys on three different visits in trying to get Internet access, also half and half. Tourism is very much down here, due to the economy and fear of drug violence, plus the bulk of the “snow birds” arrive after Christmas. This is the first time I’ve been here in December, and it is quite different from the January through March season. The house I’m renting for December hasn’t had anyone else in it for a very long time, and thus the problems I encountered with no English TV channels and no Internet, hadn’t been reported earlier. The first cable guy came in response to a call from Delfino, but didn’t know where “the box” was, and thought it was in the other house, which is unoccupied, and I didn’t have keys to that. Delfino arrived early the next morning to give me the keys to the other house, but cable guy #2 found the box right by the front door to the compound. When he unscrewed the cable, water poured out and he pointed out the corrosion present. I wondered aloud how it was possible to have water in the cable when it rarely rains here. #2 dried the connection and established temporary Internet access until cable guy #3 could come out and totally replace the damaged cable. They give a fairly long window during which the workmen can come, and of course that means I have to stay in the house, but they do come within that window. Yesterday, #3 replaced not only the connection from my house to the street cable, but the street cable, also. Anyway, problems solved. I can listen to the news on CNN while I get dressed in the morning and I can send and receive e-mails and check the Internet. These possibliities, BTW, enable me to be here for as long as I am. I am able to do all of my business via the Internet. What an amazing thing it is! I’ve already made three business calls to the US via Skype for pennies each. 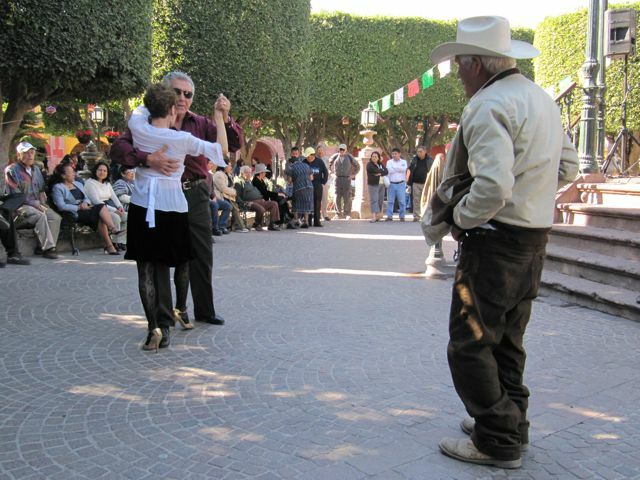 One of my favorite things here is the Sunday Danzón in the jardin. 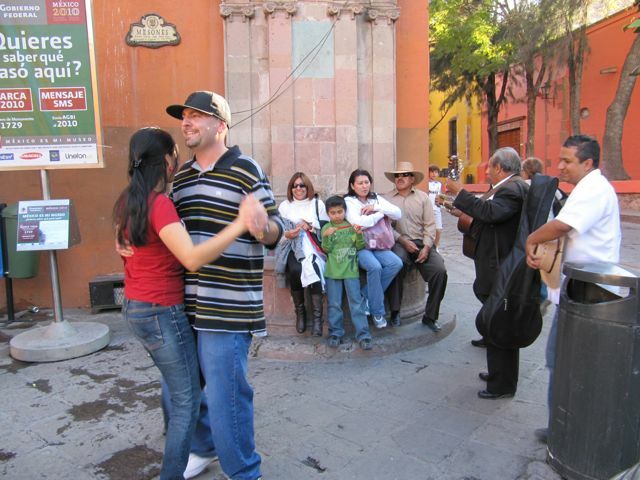 This is public dancing, formerly — when times were better and the municipal treasury was flush — to live music, but now to recorded music, along with a DJ/MC who is a gringo who’s been living in SMA forever and is married to a Mexican woman. He speaks incredibly clearly and slowly so that I am able to understand 95% of it. 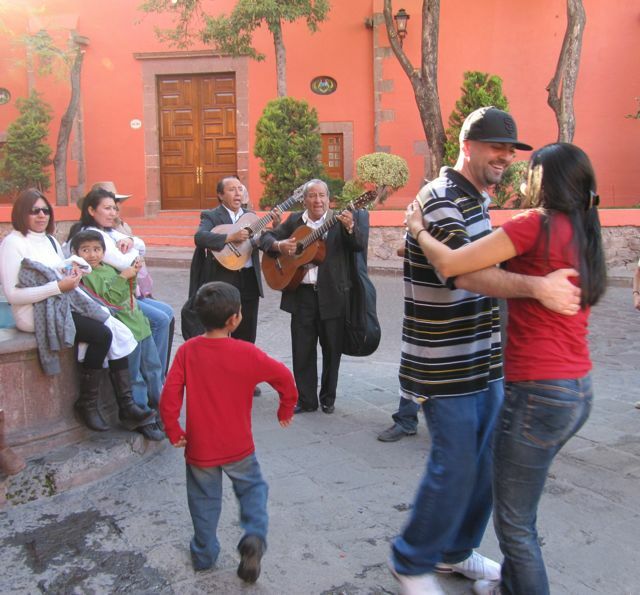 He plays a wide variety of dance music, from salsa to fox trot to cumbia to James Brown and more. 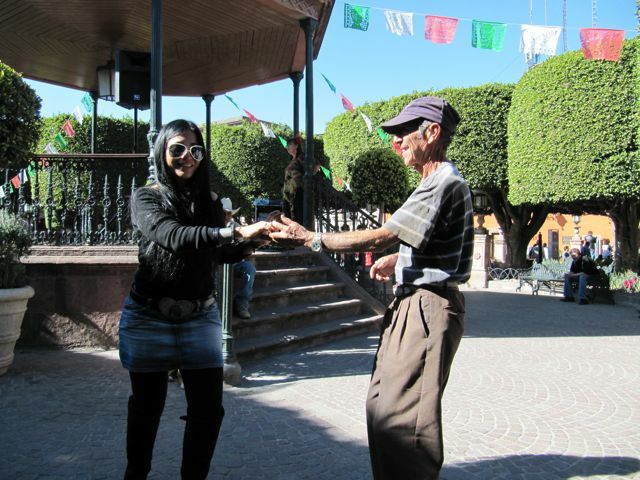 Every shape, size, color, age, and nationality gets up to dance. The photos below captured three of what I considered “odd couples.” I particularly liked the biker dude in complete regalia dancing with the much older woman (perhaps his grandmother? I don’t think so), and the much weathered man dressed in clean, but shabby clothes (could that man dance! Whew!) with the hipster chick, probably visiting from Mexico City for the weekend. 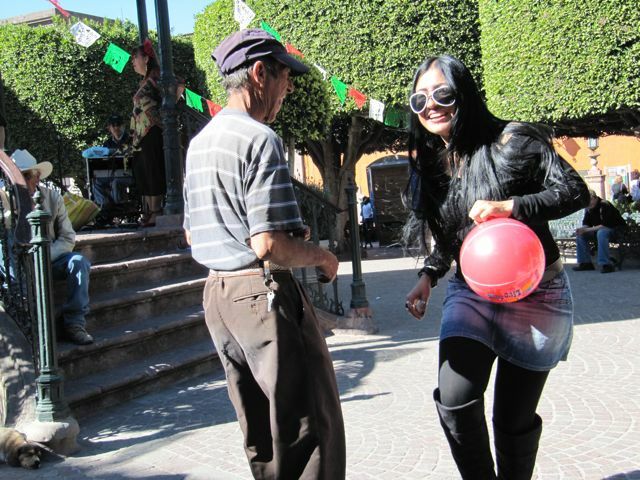 And then there’s the incredibly fit Mexican woman dancing with a seriously over-weight Mexican man. None of these couples were “together”; they just wound up dancing together in the bright, warm sunshine on a glorious Sunday afternoon. What could be bad? My blog may not have as many entries this year since I won’t be doing as many things for the first time as in other years. This past Saturday, for example, I did not go on the Sat. Adventure because I’d already done that particular trip last year. 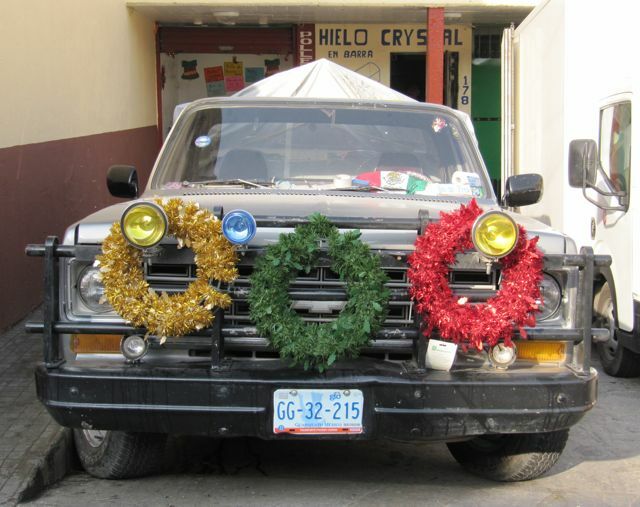 The Christmas decorations here are not overdone, and I do hear the occasional strains of “White Christmas” or “Feliz Navidad.” I always wondered what it must feel like to celebrate Christmas in a warm environment. I’m finding out. 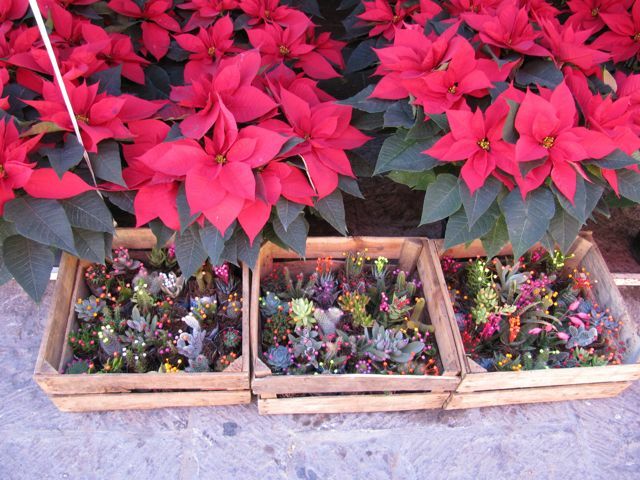 I’m going to treat myself to a poinsettia. 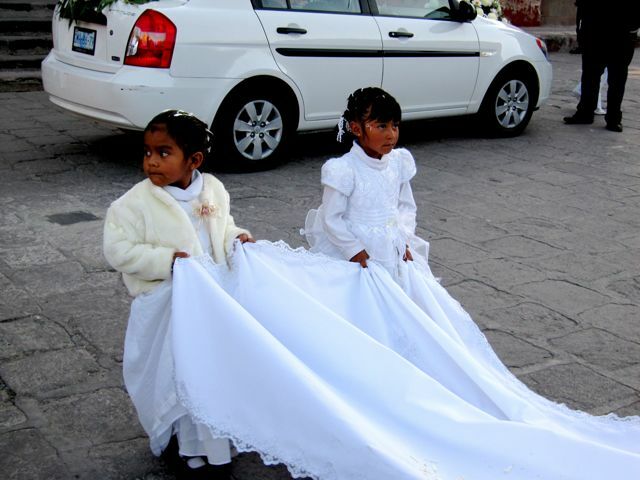 The weekly gringo newspaper, Atención, runs a color photo each week, submitted by the readership, to illustrate “Only in Mexico.” They invite submissions and because I’ve gotten very favorable feedback to my photos, I’m going to send them some. I’ll let you know if any get published. 1. A man at church, George Bell, and his wife, Peggy, moved to San Miguel four years ago when George was 90 (Peggy is considerably younger). He went to get a Mexican driver’s license. 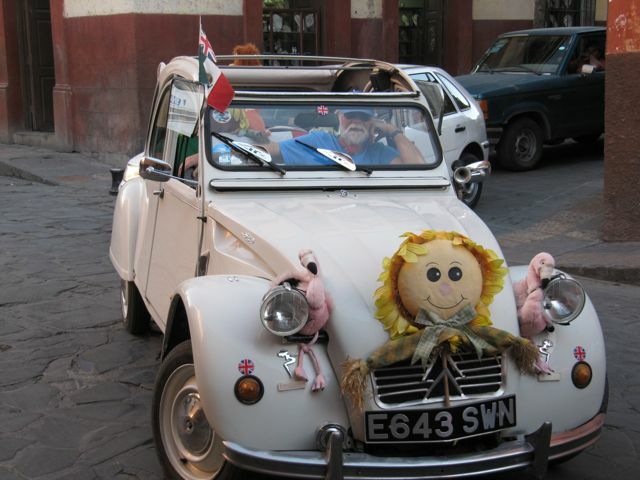 There is never an actual driving test, only a written one, and it was in Spanish, of course. George’s Spanish was not so great, and as he sat with the test paper, a man came over and asked if he could be of any assistance. The man wound up answering all of the questions for George. George passed, got his license, and plans to renew it next year at age 95, when it comes up for renewal. 2. 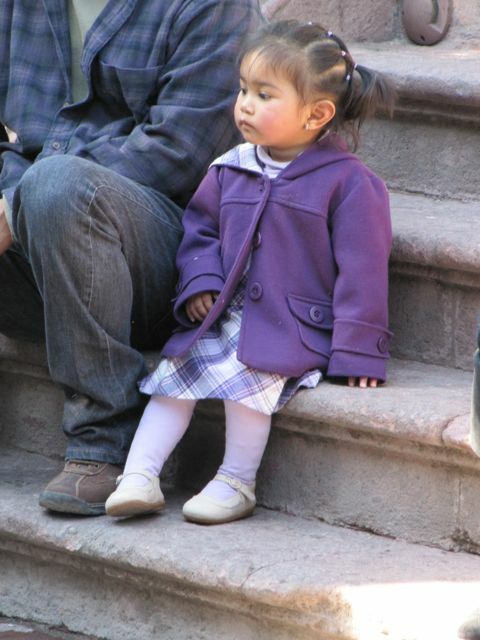 As I was coming home from the market one day, an attractive, obviously middle-class Mexican woman my age was standing out on the sidewalk near my house, holding an absolutely stunning-looking baby girl. I admired the baby and we got to talking. Suddenly, out of nowhere, she switched to English and asked me, “What is the plural of veterinarian?” Say what? She didn’t pronounce veterinarian correctly, but I got it anyway. After I told her the plural and helped her to pronounce that very long word, she told me that she is trying to teach some English to her grandchildren. Starting with the word veterinarian? 3. A few doors down from my rental is a bakery. The other day, as I was walking by, a woman came out carrying a huge sheet cake (it looked like a Spider Man design to me at quick glance) on a piece of cardboard. 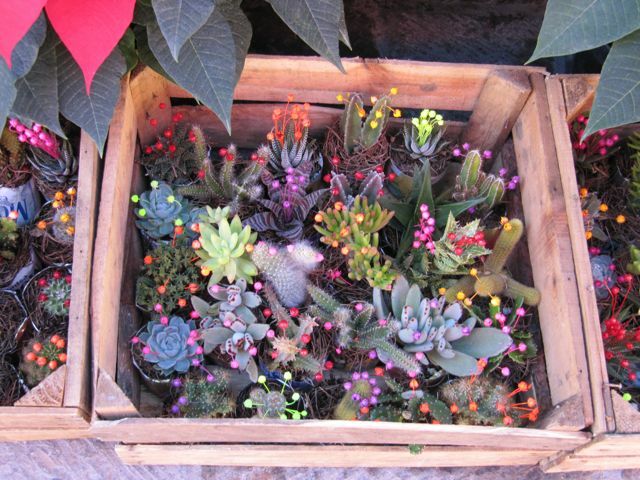 It was not in a box, but open to the dusty air. I thought this was strange. Not an hour later, I was reading in Sandra Cisneros’ book, “Carmelo,” these words: “Birthday cakes walking out of a bakery without a box, just like that, on a wooden plate.” I was floored. This book was written in 2002 about the writer’s memories of her early life in Texas and Mexico. She was born in 1954, so this method of taking home birthday cakes goes way back. BTW, Sandra Cisneros is the keynote speaker at this year’s SMA Writers’ Conference in mid-Feb., so I felt I should read something of hers. I have signed up for the whole three-day conference this year, and am really psyched about it. 4. I passed a Mexican woman wearing a T-shirt that said, “Trust Me, I’m Blonde.” And trust me, she wasn’t. I wonder where she got it and if she has any idea what it says. I now have a schedule of regular activities, which always makes me feel better. 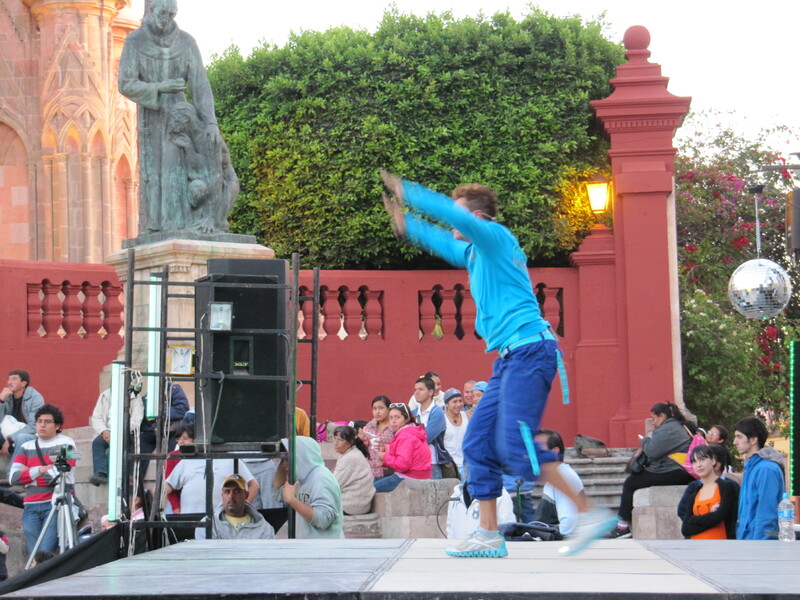 On Mondays, Wednesdays, and Fridays, from 9:30-11, I have yoga at Bellas Artes, now an arts center, but formerly the cloister area of the Convent of the Immaculate Conception, built 1755-65 and deemed the “most ambitiously landscaped cloister in all Mexico.” I really belong in the intermediate group, but that meets at 8 am., and I just can’t do that, so I attend the beginners’ group. It could kindly be called Yoga por Viejos, as I am probably the youngest person there. The room is cavernous and is quite full of yogi wannabes. I wonder how we’ll all fit when the snow birds arrive in January. The instructor is a Mexican Rodney Yee. It’s a little hard to understand him with his accented English and the weird acoustics of the room, but I make sure to station myself very close to him and that seems to work. 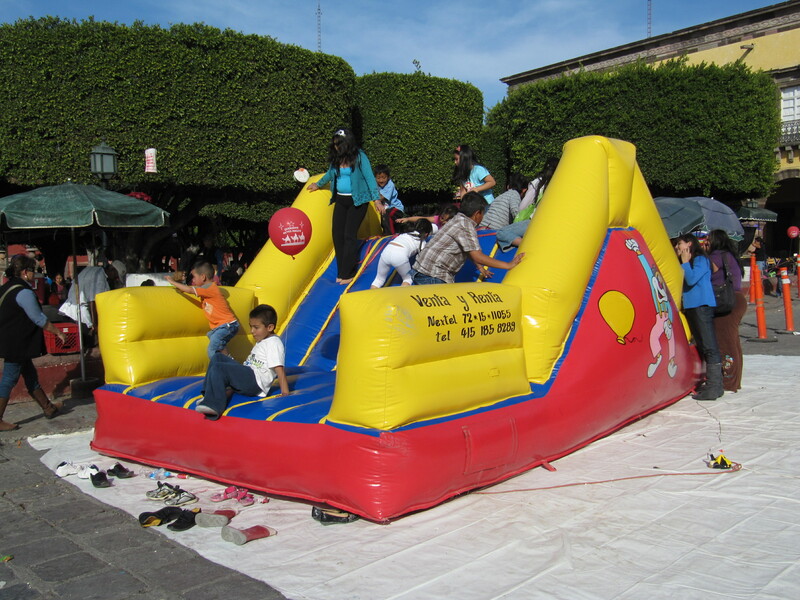 They have a frequent flyer program, where for 350 pesos up front, you get ten 1 1/2 hour lessons and rental of a mat, blanket, block, and strap, so I don’t have to either buy or schlep any of that stuff. That works out to $2.89 USD per lesson, quite a deal! In January, I’ll not go to yoga on Fridays, as I’ll be attending a short-story discussion group each week at that time. I attended a few sessions last year and really enjoyed the stories, the discussions, and the mostly women attendees. 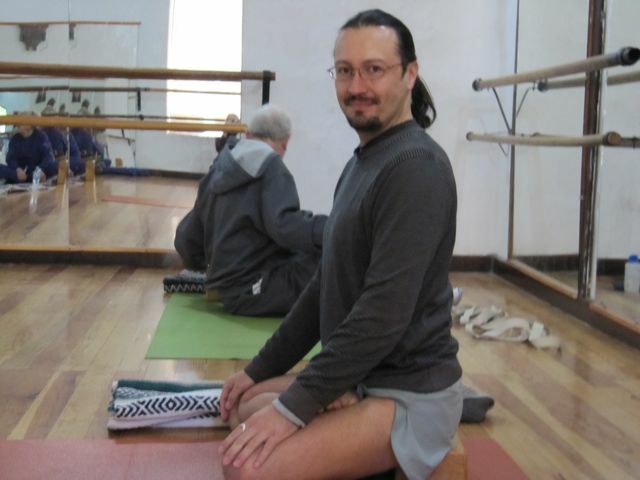 This is Alejandro, my yoga teacher. On Tuesdays, I go to the weekly discussion group of the UU congregation here. These are held in the home of Rev. Farley Wheelwright, a 94 year-old blind and nearly deaf retired UU minister and his wife, Virginia, in their home very close to my rental. Last week’s topic was “What role have fate or chance played in your life?”. We go around once first just to check in, and then the discussion begins. I was extremely moved by some of the sharing that the 14 or so people did. This week’s topic is “Meaning and Purpose in Life: What activities and roles in your life are associated with meaning, purpose, and satisfaction for you? Are there parts of your life that do not seem to have meaning and purpose and lack satisfaction? Do you think there is a common purpose and meaning to life that applies to all people? How, if at all, have religious beliefs, current or past, influenced your views about the meaning and purpose of your existence?” Heavy stuff. Following those discussions, I rush home to grab some lunch before my Spanish teacher arrives at 1 p.m. I go to the Wednesday Comida, another UU activity, that meets for lunch and fellowship at different restaurants in different neighborhoods each week. On Thursdays, I also have a Spanish lesson, in the morning. With my mornings filled, I have the afternoons to do laundry, shop for groceries, have lunch with friends, go to some of the rich cultural offerings here, or just sit in the sun and read. One day, I went to help stuff little Christmas gift bags for the 125 or so children who attend mostly art classes at Ojalá Niños, the program in which I taught English last year for the final six weeks of my time here. The weather here, while nothing like what is going on in the states, is still darned cold. Recently, it has been going below freezing at night, and rising to the high 70s in the daytime, a spread of 50 degrees, which is pretty hard to believe. I use the second BR in my rental, which you access by going outside (don’t ask; the layout of the houses in this compound defies simple explanation) for my computer room. It has a space heater with a thermostat, and in the mornings, when I go in there to check my e-mail, it reads in the low 50s. If I’m in there for a couple of hours, it can get up as high as 60; it’s never gone above that. I think that most of the heat from the fake log gas fireplace in the living room/dining room/kitchen space goes two places: up to the extremely high ceiling and up the stairs to the second floor, because there it’s quite cozy; it is only just tolerable on the first floor. The second floor also gets an infusion of brilliant sun each day. There is a gas fireplace up there, too, but I only need it when I first get up in the morning. I asked my maid one particularly cold morning when she arrived if she had any kind of heat in her house and she said no, that they can’t afford the electricity it would take to run a space heater. I just don’t know how they stand it. And the people out in the campo, where it’s much colder, and where they have dirt floors on which they sometimes sleep, I can’t even imagine. None of the houses in SMA — even those owned and rented by gringos — have central heat or air conditioning, as it’s usually not needed, but at least we have fireplaces, space heaters, and overhead fans. 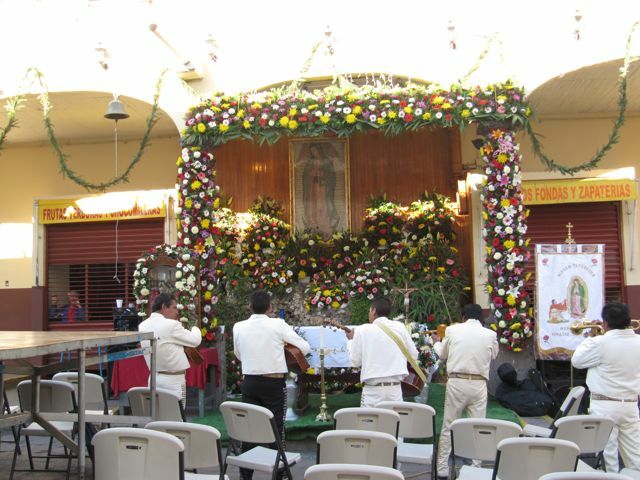 A shrine to the Vigin of Guadalupe erected in front of a huge fruit & vegetable market very close to my rental. 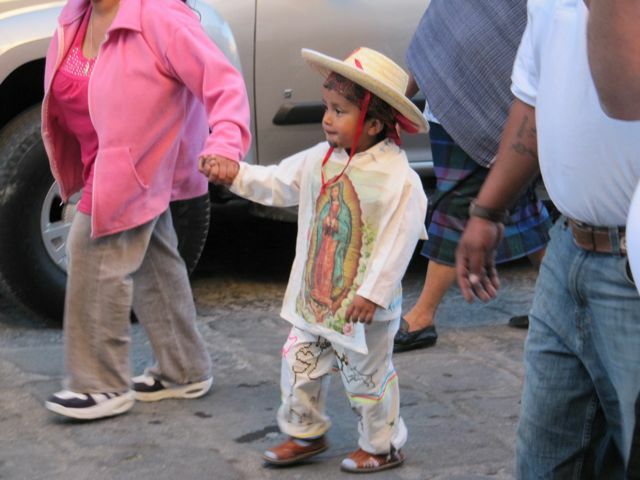 A boy in a parade dressed as Juan Diego with the image of the Virgin on his shirt. On all holidays, political or religious, firecrackers are set off very early in the morning, presumably to awaken people to get the celebrations started. The firecrackers invariably set the dogs to barking. I was awake already when I heard the first blasts around 6 a.m. on December 12; my friend Sandy said she was awakened by some at 4:30 a.m. Usually, after a half hour or so, they stop, but on Deember. 12, they continued sporadically all day long! The last thing I heard that day before I fell asleep at 10:30 was the sound of firecrackers. In the dark and stillness of early morning, when the sound of firecrackers echoes in the nearby hills, it’s quite a wonderful sound. 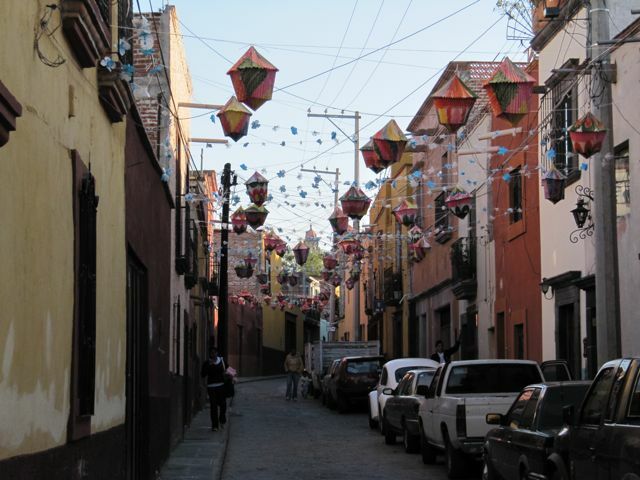 Most guidebooks warn viistors about this custom, as the firecrackers do sound like gun fire and could lead gringos to think that the next Revolution had started or that the drug cartels were having a shoot-out (not that any of that takes place near here). 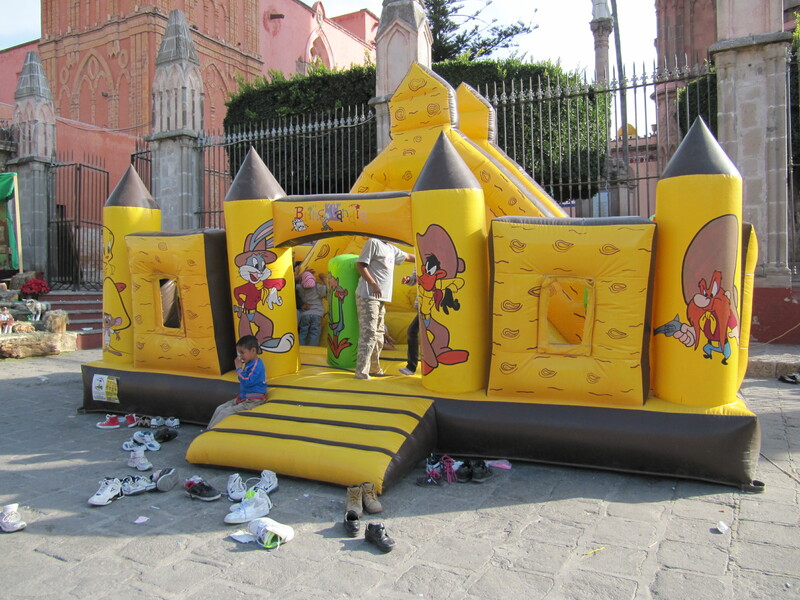 I had a funny experience involving a creche scene at the biblioteca. It had been newly set up and I went over to look at it, only to discover that there was no baby Jesus. I thought maybe some kid had run off with him. 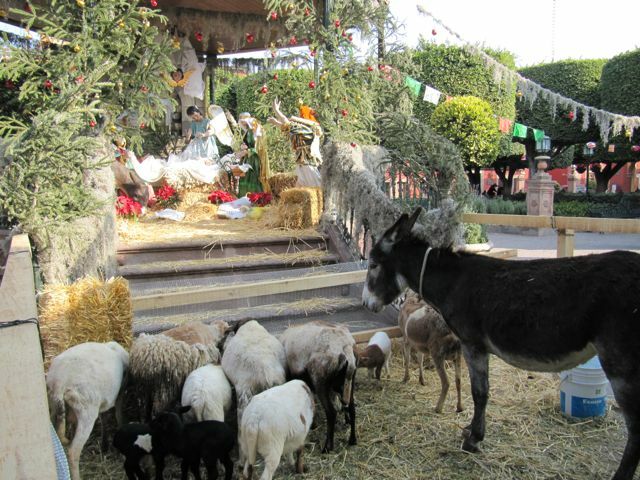 When I went into the office to buy a movie ticket, I told the director of programming, José Luis, of the absence of Jesus in the creche, and was told, “He hasn’t been born yet! When he is, he will appear in the creche scene.” I told him that in America, Jesus is always in the manger from whenever the scene is set up. 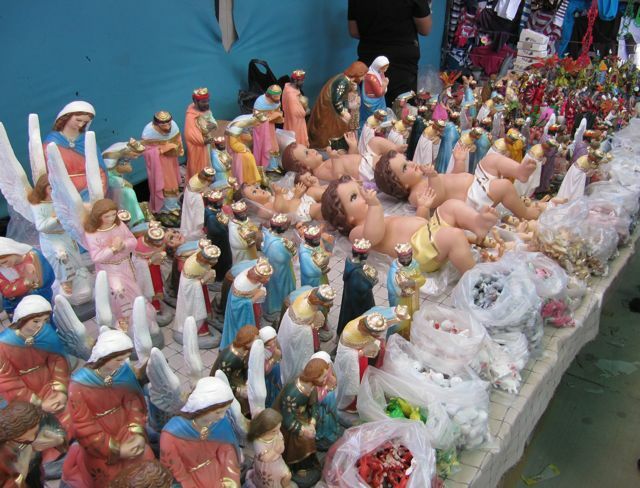 One can see thousands of baby Jesuses of all sizes and colors for sale in the stores around town. 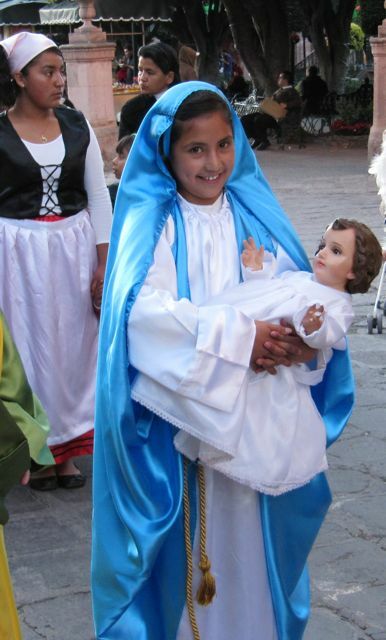 This girl is carrying a pretty good-sized Jesus in a posada (which means hotel in Spanish), a parade of children each of the nine nights before Christmas, representing the nine days that Mary and Joseph traveled until they found lodging. 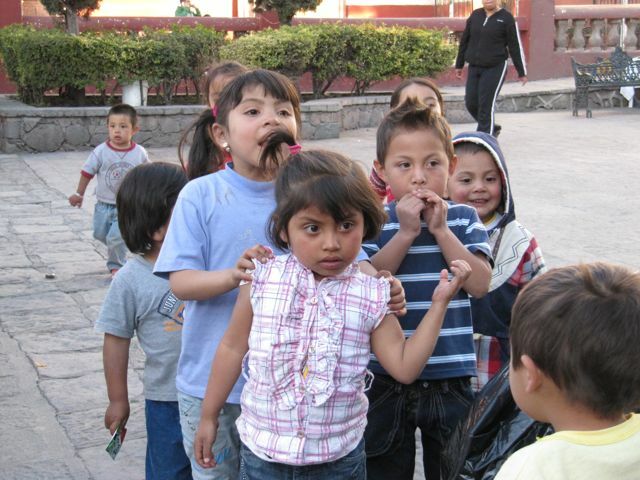 The children stop at various homes along the way, and there is a script sung back-and-forth between those outside, asking for a place to sleep, and those inside, refusing them, until at last they find shelter. The Pilgrims: In the name of the heavens I request lodging from you, because she cannot walk, my beloved wife.” The Innkeepers: “This is not an inn. Go on ahead. I can’t open up for you in case you’re a crook.” After three or four more refusals, comes this from the Innkeepers: “You are Joseph. Your wife is Mary. Come in travelers! I didn’t recognize you.” and from the pilgrims: May God pay gentlemen for our charity and may the heavens overwhelm you with happiness.” Then everybody sings together. I lost Internet access a few days ago, and the same Cyber Matsa technician who had come before, returned. He found yet another cable box where the cable was dripping water. I offered to go get him another servietta (napkin) to dry it. I asked him if he remembered the word in English for servietta which I had taught him the last time. He thought for a while while I went to get it. When I came back, he proudly said, “kidnap!” I could totally see how he could have mixed up those two words. I explained the meaning of that word and told him about napkin again. 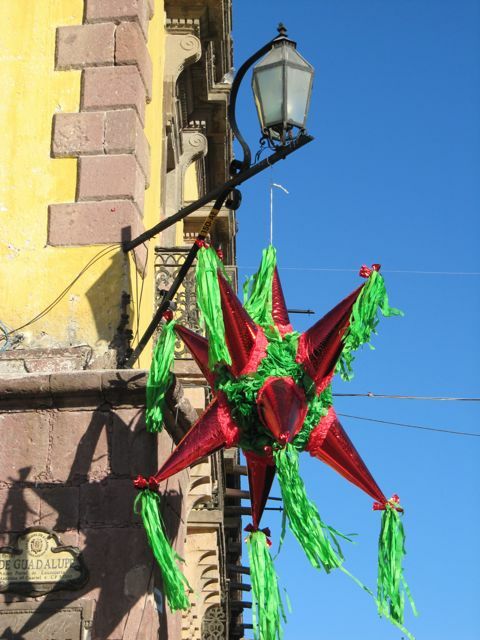 Christmas decorations keep appearing all over town. There is no “less is more” aesthetic here. 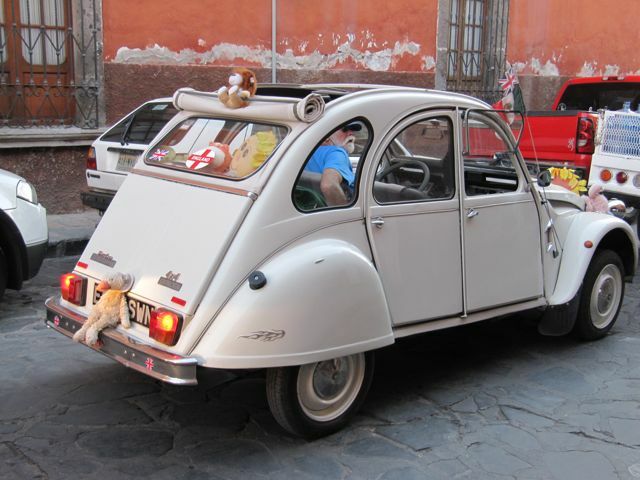 I cannot imagine how a bus this size got through the streets of San Miguel! 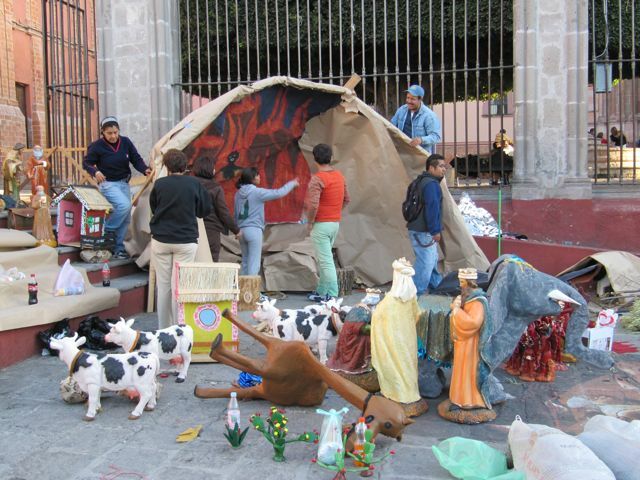 This is a creche scene going up in front of the parroquia. I don’t remember there being elephants or cactus in the story. And certainly not devils! 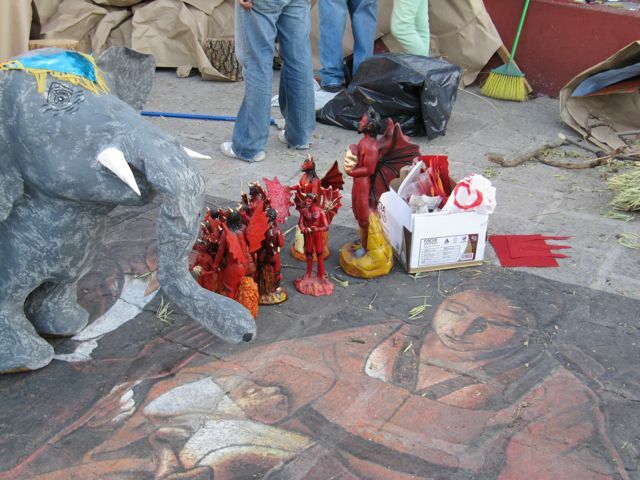 Check out the beautiful painting of madonna and child right on the sidewalk. What’s with the wishing well? I can’t wait to see the finished product with all of these disparate pieces in place. I’ll send you a photo. There are always about 10 things going on at once here. 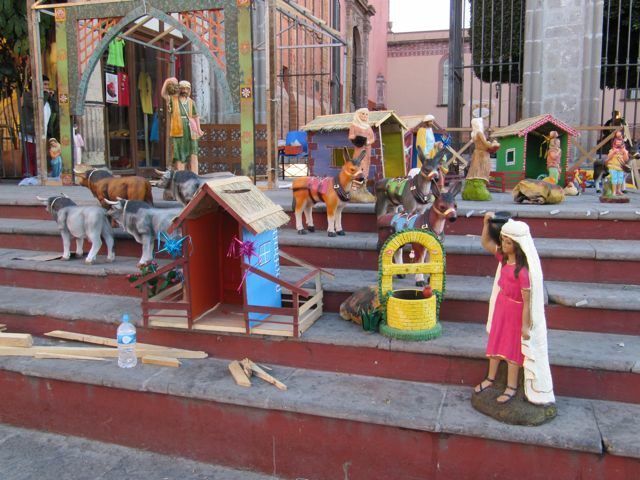 While the creche scene was being installed, the posada was forming, and a wedding was taking place. 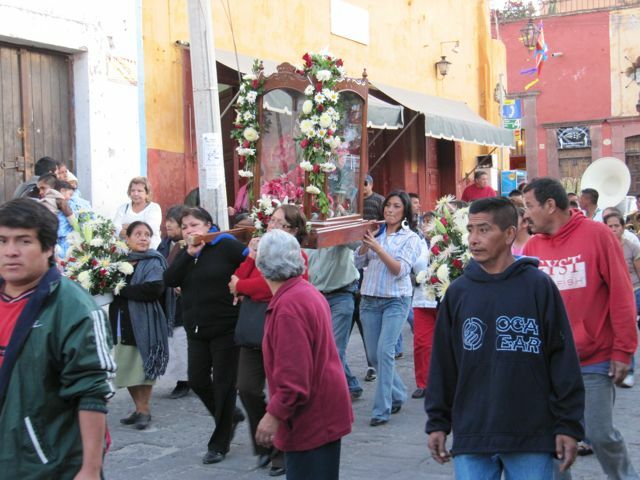 One morning on the way to yoga, this small, religious parade passed me by. 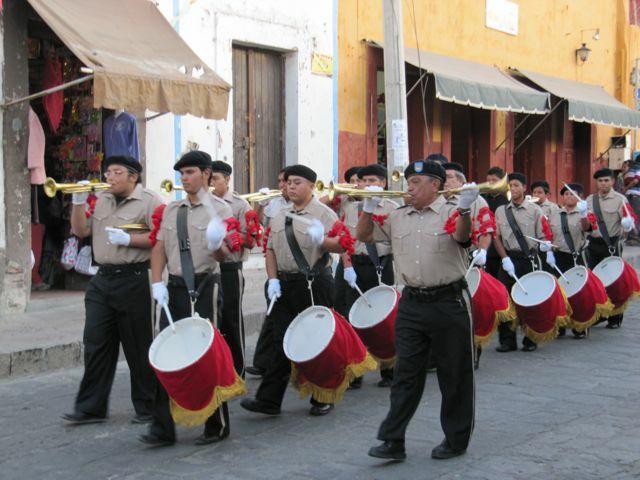 It started with this sort-of-military-looking drum and bugle corps. Next up, the Indian dancers. Then some kind of religious icon. 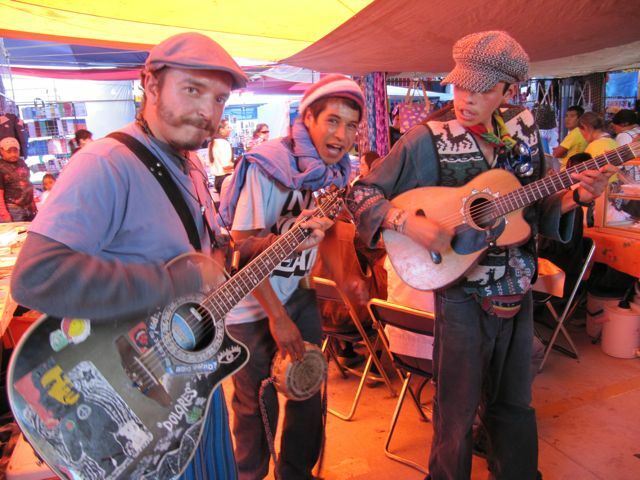 And finally, this rag-tag band, playing at top decibel. When my Spanish teacher, Carlos, came to the door for my first lesson this year, he said he used to come here to teach the former owner of this house, Janine. The maid had just been telling me about Janine, and what a spirited, fun woman she was. What a small world here in SMA. Do you remember my neighbor with the gorgeous baby about whom I wrote last time? Well, I met her again on the street, and again we spoke. She asked if I’d like to do an intercambio with her (getting together to speak English half the time and Spanish half the time). I jumped at the chance. We had our first meeting at her house from 6-7 on Tuesday, Deember. 21. I didn’t know what to expect. I knocked on her door and a woman who I now think was the maid, let me in and led me to a small sitting room. Mercedes soon appeared and we had a really fun time with her reading me a silly story in English from a book she had, and asking me questions about words or phrases she didn’t understand. Then I asked her to ask me questions in Spanish for me to answer. It went very well. We decided to do it again on Thursday, same time, same place. That evening, she asked if three of her nieces and nephews, ages around 8, 9, and 10, could sit in with us. Of course I agreed, and this was even more fun than when we were just the two of us. We read a story in the same book about ducks hatching and there was lots of new vocabulary, like beak, webbed feet, hatch, egg, shell, down, feathers, etc. During the Spanish part, the kids enjoyed asking me questions like what is my favorite color (then we practiced all of the colors in both languages), do I have any children, when is my birthday, etc. We set up a date again for the next Tues., and I left feeling as high as a kite. This is so much what I enjoy doing. 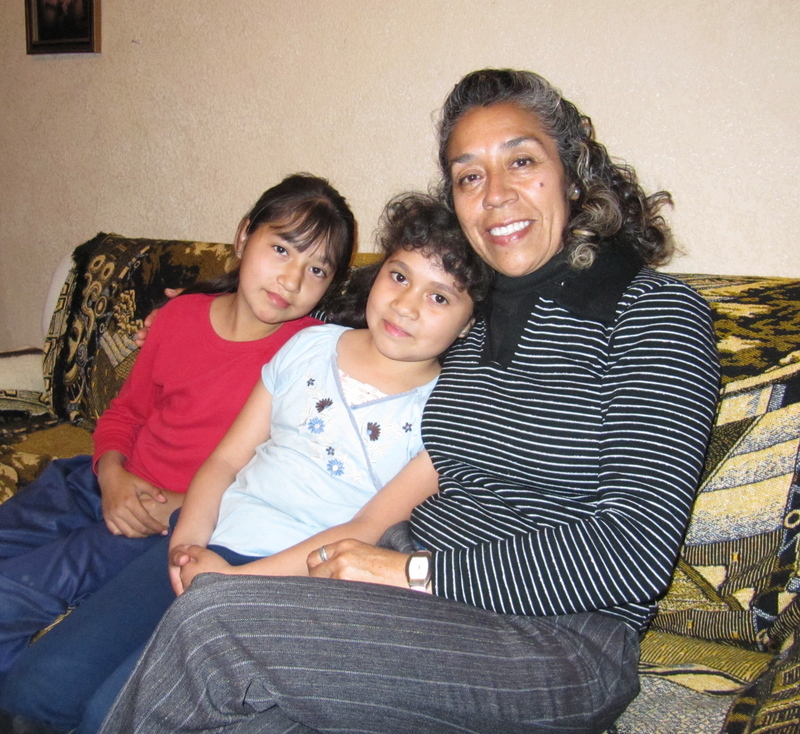 Mercedes lives in an enormous compound with some of her grown children, some grandchildren, her sister and her sisters’ children. You actually walk into the garage when you first come in to her place, and they also run a market “from time to time” from their home, leaving the garage door open. 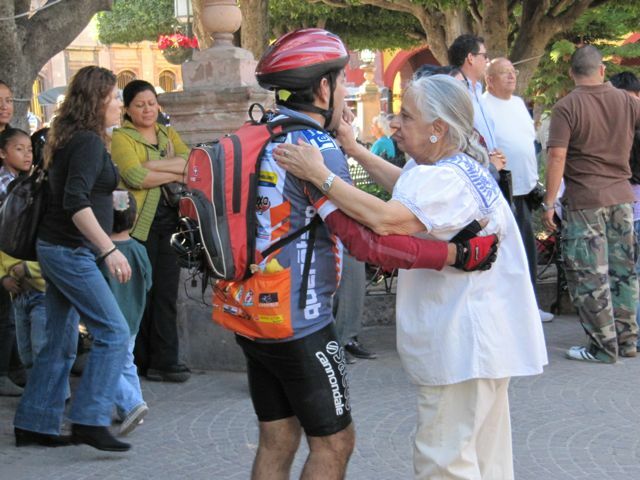 Added to the exhilaration of this experience was that of having my photo published in Atención. I am just feeling wonderful! 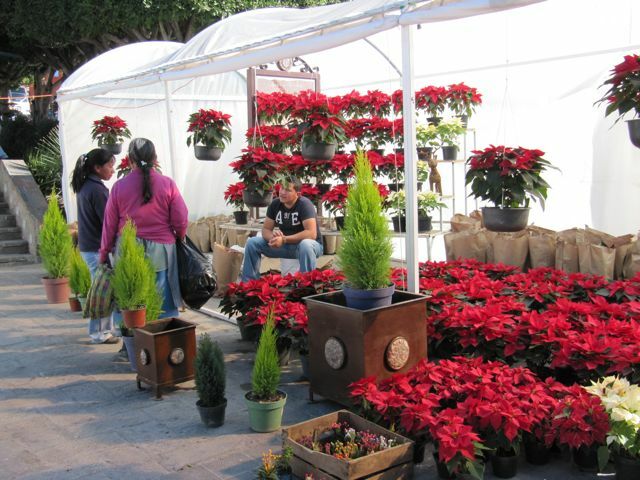 It was suggested that I go to Tianguis (Tuesday market) for an anti-mall experience. 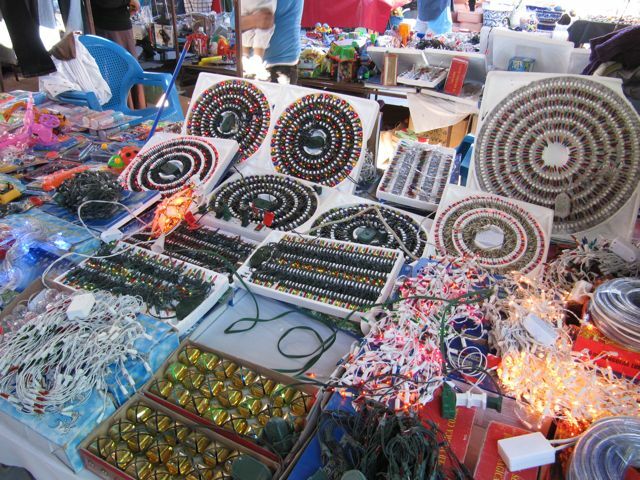 I’d been to Tianguis several times other years, but decided to go again. There were lots of things for sale for celebrating Christmas, including all of the figurines, in a variety of sizes, to make a creche. I found out that each family sets up a creche in their home. 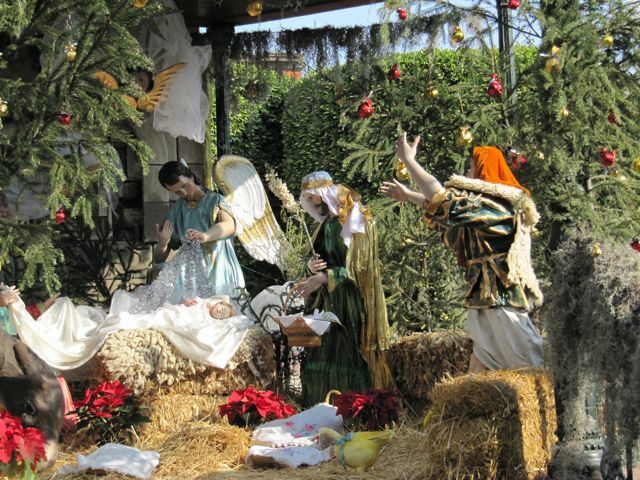 They dress the baby Jesus in any number of lavish costumes, and I saw women trying to make up their minds among several different get-ups for their baby Jesus dolls. On Christmas Eve, they bring the dolls to the mass, either cradled like a real baby or in baskets, for the priest to bless. Once blessed, they can then be added to the creche scene at home. 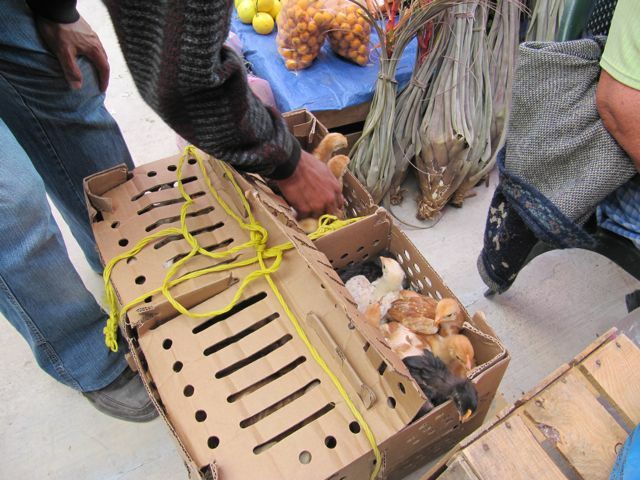 This man was selling pollitos (little chickens) at Tianguis. I heard his announcement as he walked around with the tied-up boxes, so I shadowed him until someone wanted to buy some so I could get this photo. Some jammers entertaining the crowds. 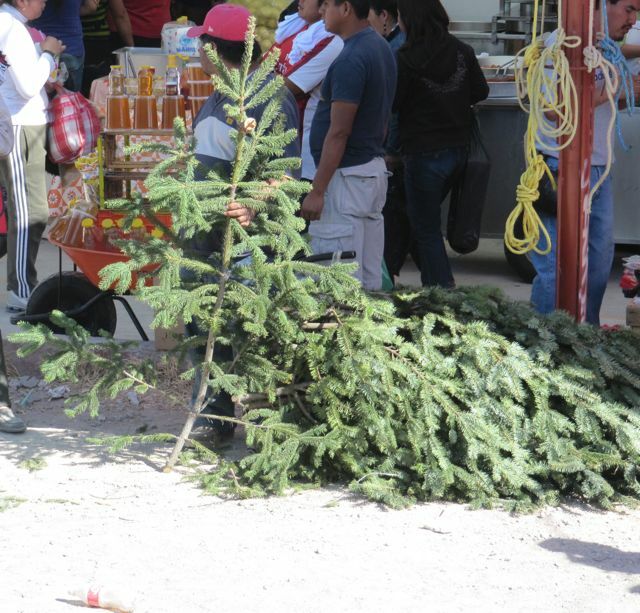 They don’t sell Christmas trees (probably way too expensive), but rather Christmas branches. 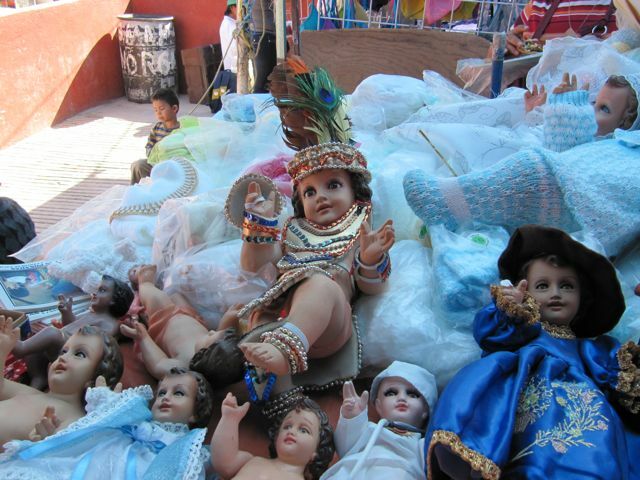 Here is a display of baby Jesus dolls in some of the hundreds of costume choices available, or buy one in a diaper and make your own. Every one of these light sets was flashing on and off and playing a different Christmas tune. And this scene was repeated table after table. It was a little overwhelming. 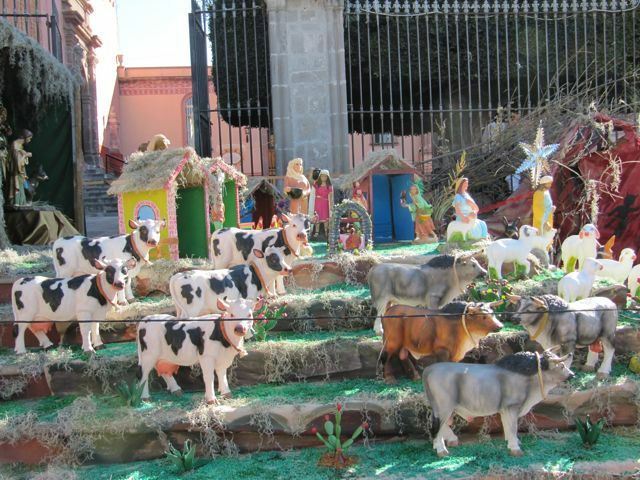 What I thought was a creche scene near the parroquia wasn’t. 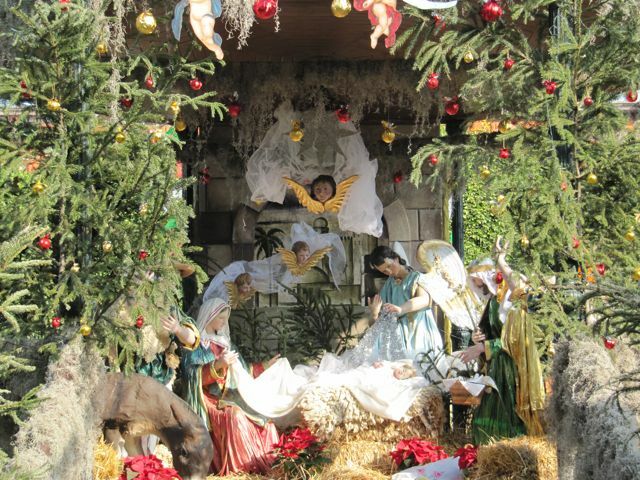 The creche scene was coming together in the bandstand in the middle of the jardin. This represents the annunciation (an angel telling Mary that she is going to produce a son). Lots of livestock are represented. 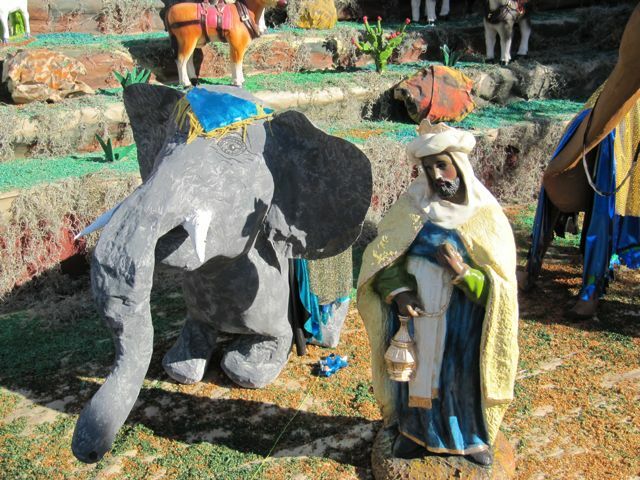 I love this papel-maché elephant and one of the three kings coming from the east. And this camel is equally fetching. I never did get any explanation about this vision of hell, complete with flames and devils, that is part of the display. 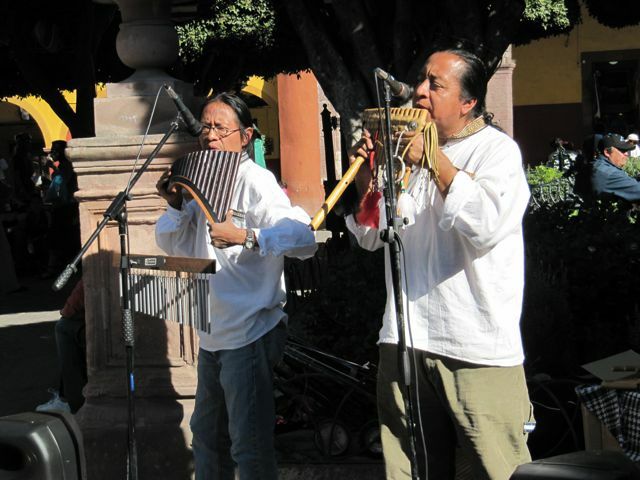 Some pan-pipe players who were entertaining in the jardin. I’m crazy about that haunting sound. I’m quite sure they are not Mexicans. Another Sunday afternoon danzón, the last of 2010. 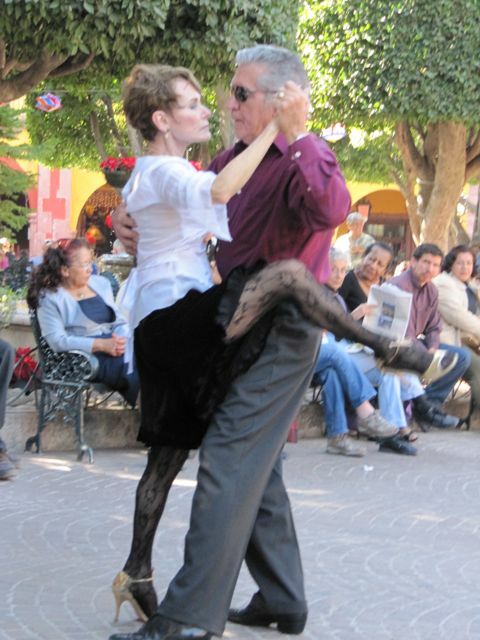 Here are Raul and Peggy, expert dancers, executing a tango. All eyes were on this fantastic pair. I loved the old-timer taking it all in. A penny for his thoughts. 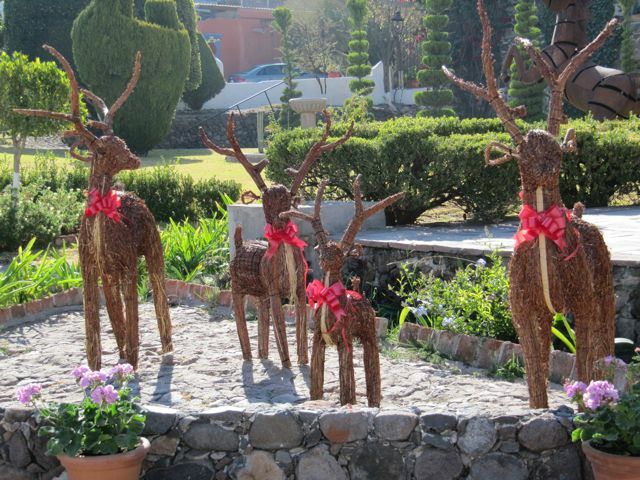 Some charming Christmas decorations at the hotel where my UU congregation meets, made entirely of natural materials. 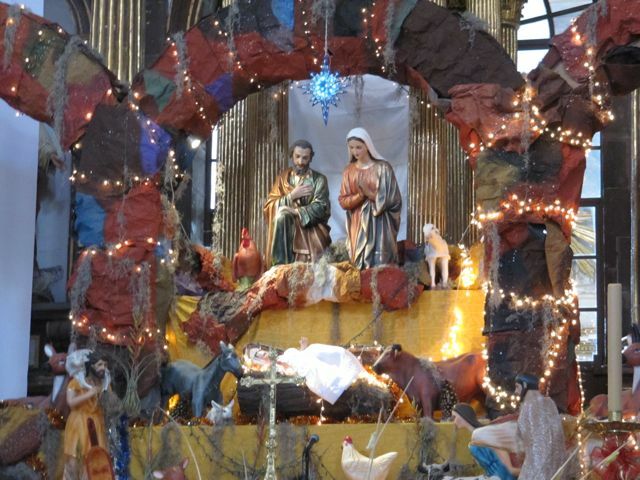 This is the creche set up in the bandstand. (Photo taken Christmas morning, thus Jesus is in the manger at last.) This is an extraordinarily complex display with lots going on. Live animals are in front, to the delight of the kids. 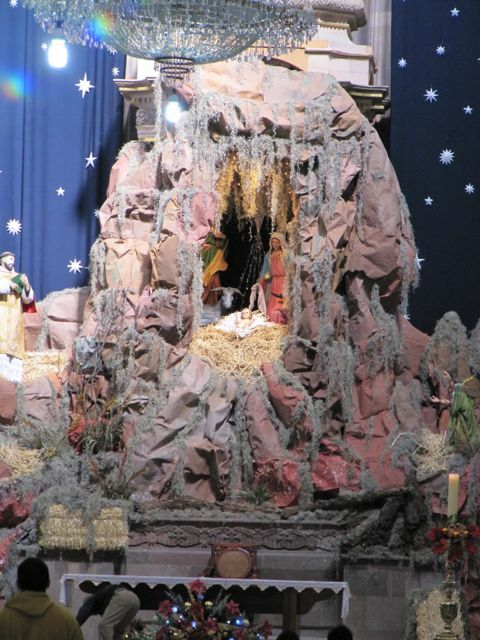 On Christmas Eve, I wanted to join the final posada and to attend a midnight mass. Neither happened. 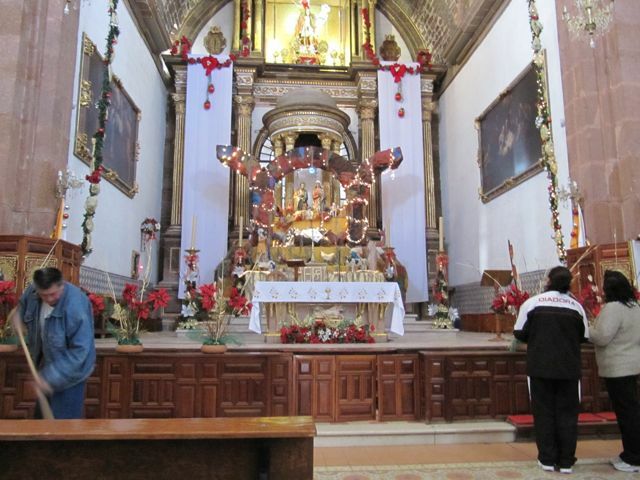 I met some friends as I was walking to the announced posada gathering place and time, but there was nothing happening then and there, so we walked up to the parroquia at about 7:30, and found that a mass was in progress. We sat in on it for quite a while. 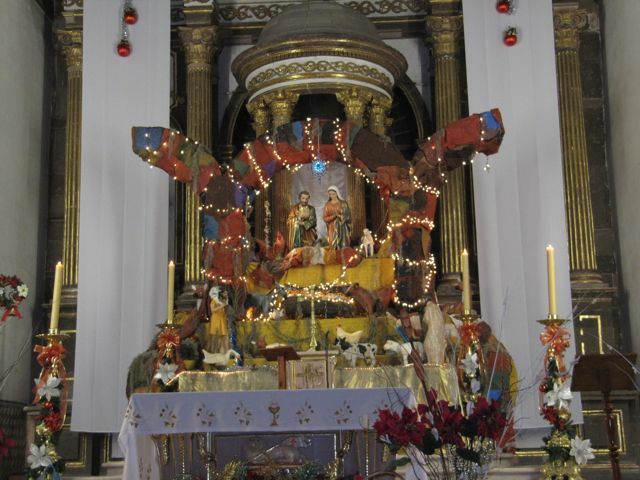 It was not what I had been expecting, but the church was decorated magnificently; it had obviously taken a great deal of work to transform it into the sparkling, blinking, riotously colorful place that it was. 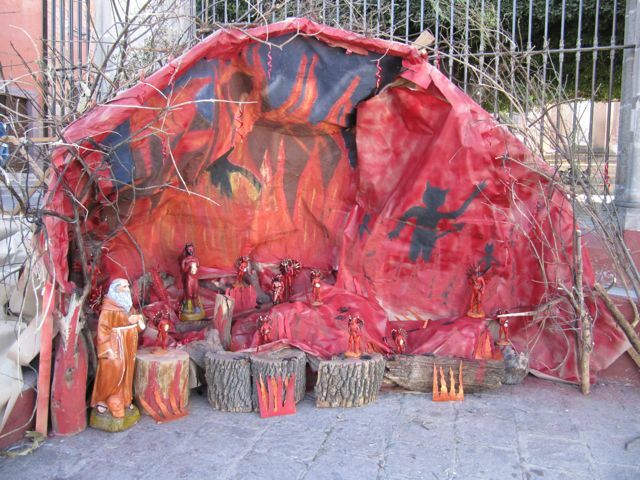 Here’s an entirely differently-realized creche scene in another church. Again, I am in awe of the work to bring this to fruition. 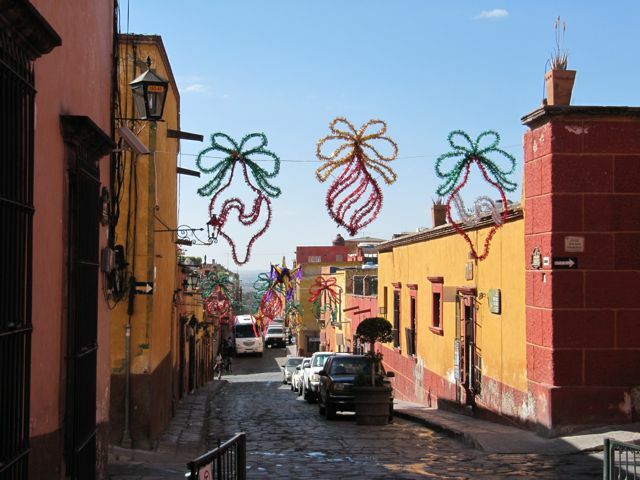 On Christmas morning, I attended — along with Sandy and a friend named Marge, and about 50 other gringos — an historical walking tour of San MIguel. I had taken this tour two years ago when I first arrived, and knew much of the information and all of the places, but it was good to hear the fascinating history again, and I did learn some new things. We went our separate ways mid-day. I returned to my rental and with an eight-hour time difference, Skyped with both of my kids, their spouses, and my grandchildren, all of whom were in Helsinki together. Really, the technology is a miracle — and it’s free! Imagine! My Christmas was complete. 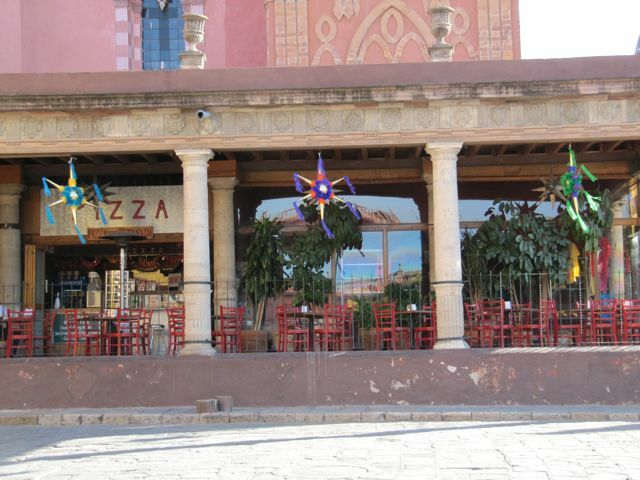 However, Sandy, Marge and I re-met at 3 p.m. to take a taxi to a spectacular hotel/restaurant called La Puertecita for a lovely fixed-price, fixed-menu meal in a charming setting. We all brought doggie bags home with us. 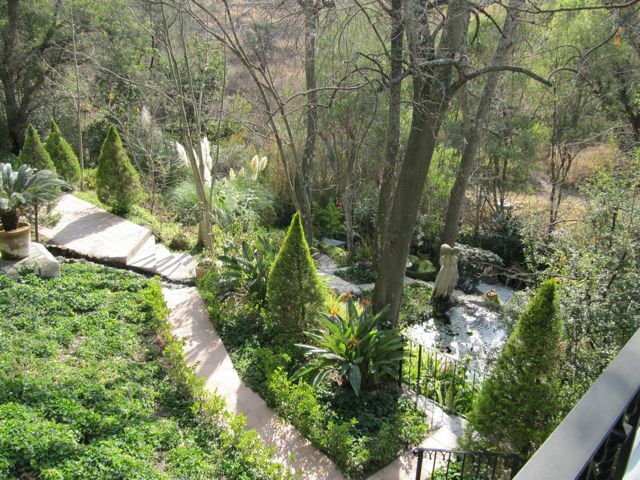 This is the garden we overlooked as we ate our meal on a covered patio outside. Wow! 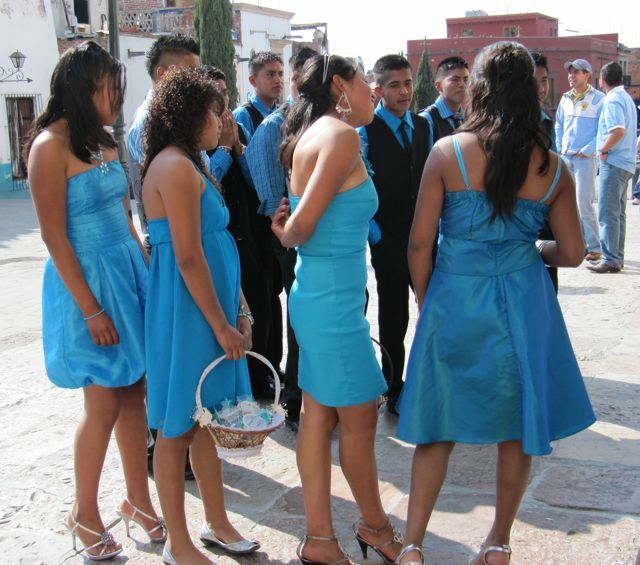 Walking to meet Sandy and Marge for dinner, I came across this quinceañera (15th birthday celebration, similar to our Sweet 16 parties, but a HUGE deal here), which I thought was odd being held on Christmas day. 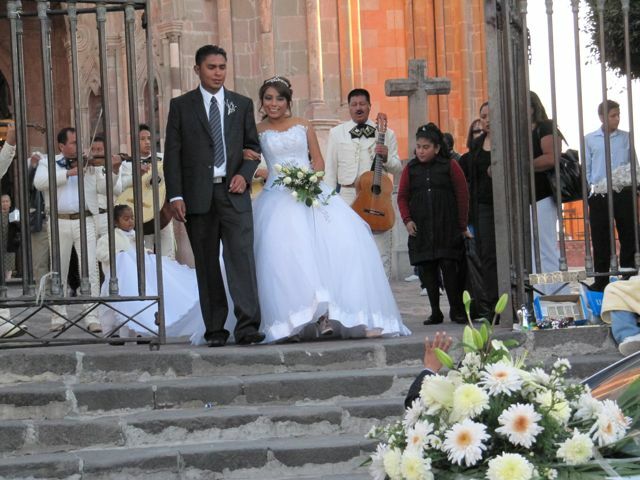 She’s looking quite pensive as she prepares to enter the church. 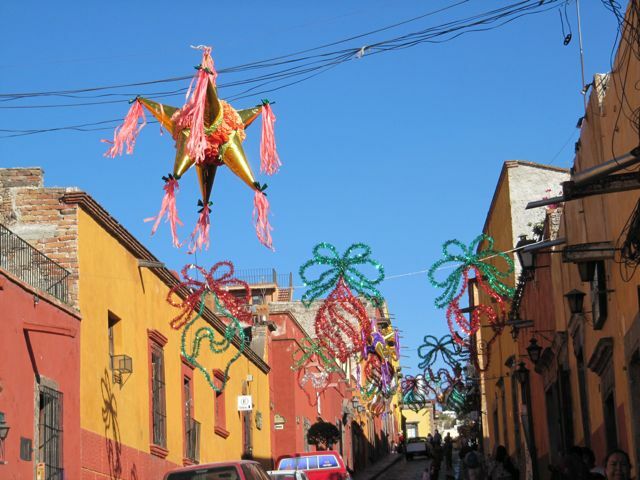 In San Miguel, Christmas is a religious holiday, pure and simple, and the big deal is Christmas Eve. On Christmas Day, it was business as usual. 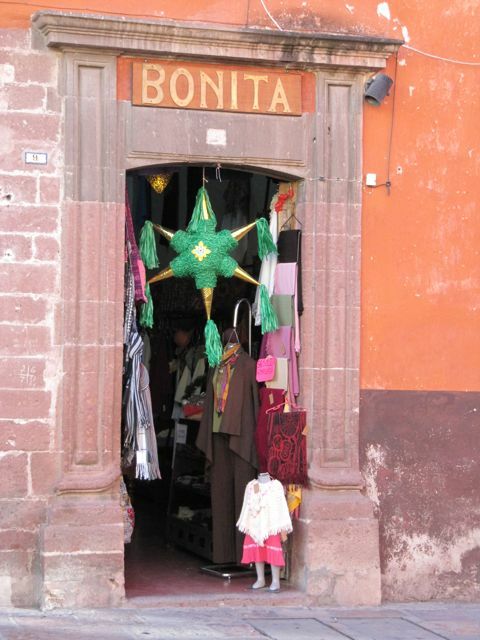 Many stores were closed, but the big fruit and veggie and artisans’ markets were open. There were throngs of people in the streets. 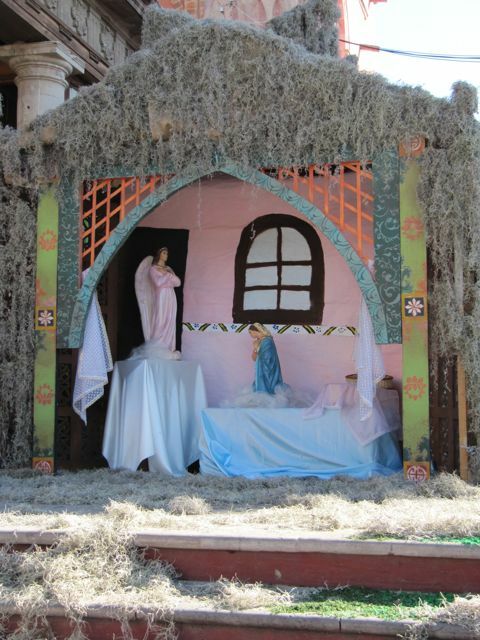 The gift giving to children takes place on Three Kings’ Day, Jan. 6. Things pretty much slow down between Christmas Eve and that date. I showed up at the appointed time last Wednesday mornng for yoga at the Bellas Artes, and saw one of my classmates exiting the facility. I asked her what was going on and she told me there was a sign on the door telling us all to go across the street to the Arthur Murray dance studio (yes, there is an Arthur Murray franchise in SMA and it does very well!). It turns out that Alejandro, our instructor, received a phone call at 6:30 the previous night informing him that as of Wednesday, Bellas Artes is closed — for a year! — for renovations (and this after Alejandro has been a tenant there for 20 years). He had to scramble for a place to hold the class. Ordinarily we could have done our yoga on the first level huge dance floor at Arthur Murray, but not that day, as they were setting up for a fiesta that night. So we had to go upstairs and divide ourselves among three small, adjacent rooms, with poor Alejandro shouting instructions and moving from place to place. All of the mats, straps, blocks, and blankets were still over at Bellas Artes. We were cheek by jowl in the two rooms, but Alejandro was cool as a cucumber. Starting in January, the dance floor is already booked for Mondays, Wednesdays, and Fridays for their own yoga program, so maybe yoga will be changed to Tuesdays and Thursdays, but they are not days I could attend. Then there’s a chance for another huge, second floor space a few blocks away, but it will take time to get leases, etc. straightened out. Stay tuned! I’ll be most disappointed if I have to give up this yoga class. Yes, there are others, but this is the best and certainly the cheapest. At yoga on Friday (again squashed together in three adjacent small rooms on the second floor of Arthur Murray), we got the full story about the closing of Bellas Artes. It was really an emergency situation that caused the entire place to be closed down in such a hurried manner. Chunks of roof were falling down on the second floor, and the management was fearful that the whole place was unstable and would fall down. Thus they closed it. They are calling in engineers to assess the condition of the facility, and they are hopeful that they will be able to re-open at least the first floor in about a month. (However, I’m not holding my breath.) Meanwhile, yoga is changed to Tuesdays and Thursdays at Arthur Murray for the next two weeks. By then, they hope to be using a very large space (bigger than the room at Bellas Artes) at another nearby facility. That is not available until the middle of January, however. They took our e-mail addresses at yoga and will let us know what’s happening. I read in Atención that there is a Stretch and Strengthen class on Mondays and Fridays at the biblioteca for only 20 pesos, so, since yoga is now kaput for me temporarily, I went over to try that out. There were about seven of us all waiting around for the instructor, and someone asked if we were all new to the class. We were. Since it was now 9:05, it was obvious that the regulars knew something we didn’t. Luckily, there was a certified exercise coach among the group, who said she’d be glad to teach a class. A Pilates instructor in our midst aided her. It was a great hour. 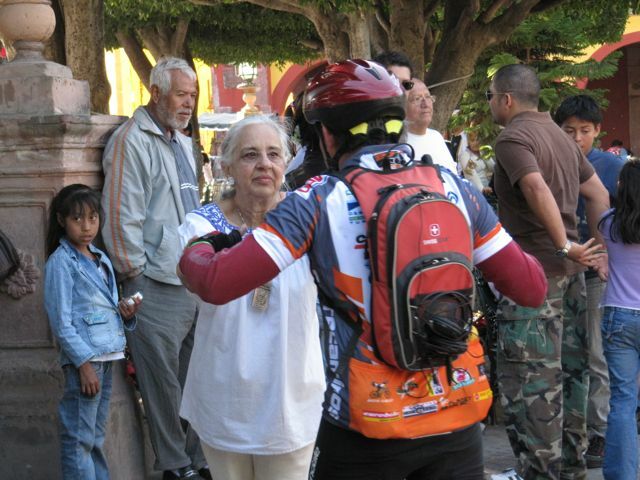 We each paid Judy the 20 pesos, although she objected strenuously, and we’re going to meet again on Wednesday. Judy leaves Wednesday after the class, so that will be that. We early-morning exercisers were a really cohesive group and I had fun. The whole thing was a typical SMA moment. One day when my maid was in my house, the doorbell rang. I wasn’t expecting anyone. Since the door is quite a long walk away — and for security — there is a video system so that one can see who is at the door in addition to being able to speak to him/her. Mari spoke to the person but didn’t go to the door. I asked who it was and she said a man with a burro selling potting soil. She said these men live way out in the campo, and start walking to town with their soil around 4 a.m. Sometimes their wives and children come, too. They then go door to door selling their product. They stay in town (I have no idea where either they or their animals spend the night) until all is sold, and then they walk the six hours back. What a way to earn a living — and how much of a living could it possibly be? 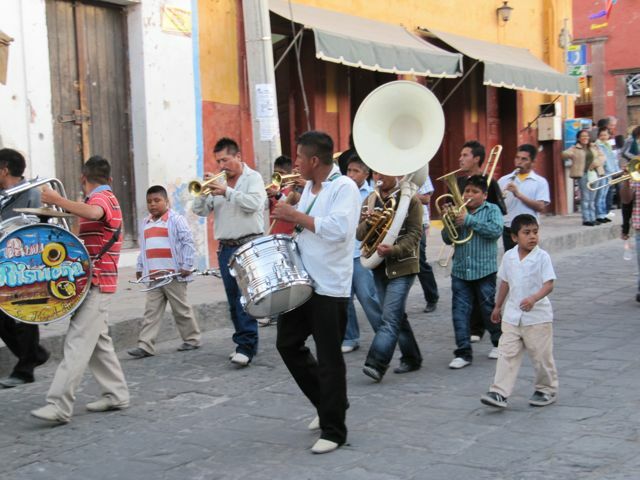 San Miguel has been a mob scene since a few days before Christmas. The cars in the streets are often in gridlock. One can’t find a seat in the jardin. 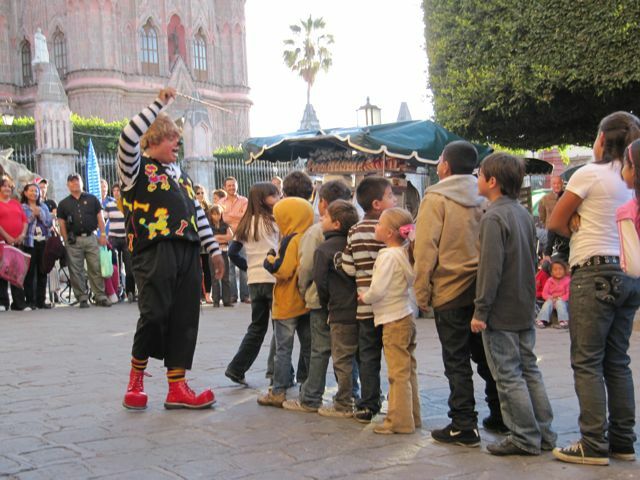 Thousands of Mexican tourists have come here for the holiday and the gringo snowbirds have returned, so things are really hopping. I’m so glad for SMA that at least for a while, tourism is in full swing. 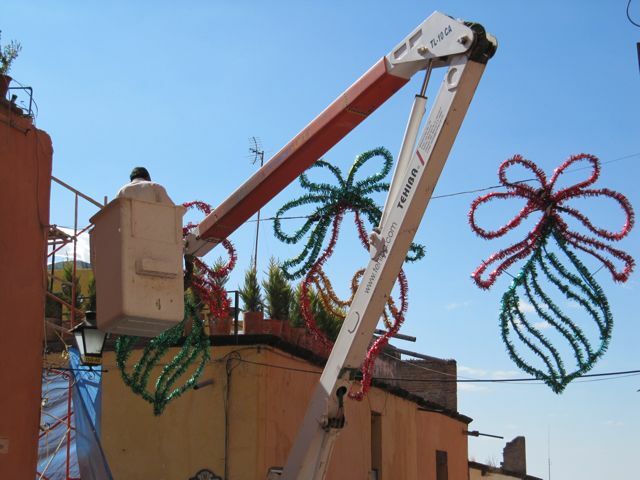 You can tell the Mexico City visitors in an instant. They’re pushing strollers and carriages (and often lifting them over the cobblestones) and high heels, neither of which the sanmiguelenses usually use. Some people left after the New Year’s weekend, but others will be staying through January 6, Three Kings’ Day. The kids are off from school until after that important gift-giving day. There was lots of time to photograph this fellow (a Brit, I think, from one of the flags) because he was in an impossible traffic jam. There were no gringo cultural activities during the week between Christmas and New Year’s so I used some of that time to go to two museums here. 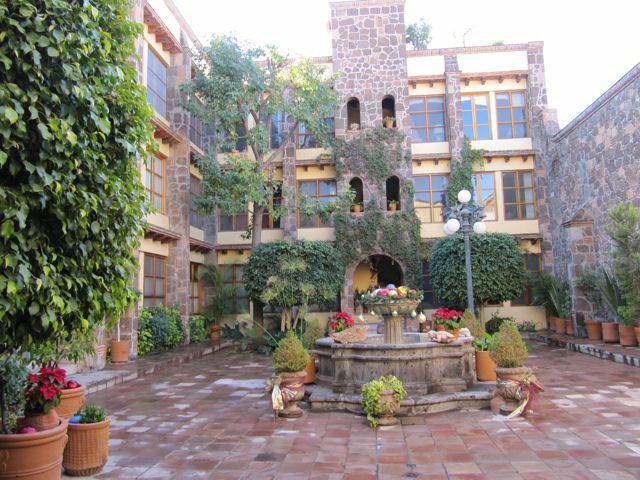 The first was the former home of Ignacio Allende, revolutionary hero, in honor of whom the city changed its named from San Miguel el Grande. Seniors get in for free all the time, and it’s free for everyone on Sundays. While the furniture exhibited is not original to the Allende family, it is true to period. I commented that from the furnishings, there was no way to tell that that family lived in Mexico; everything was Spanish and quite lavish. 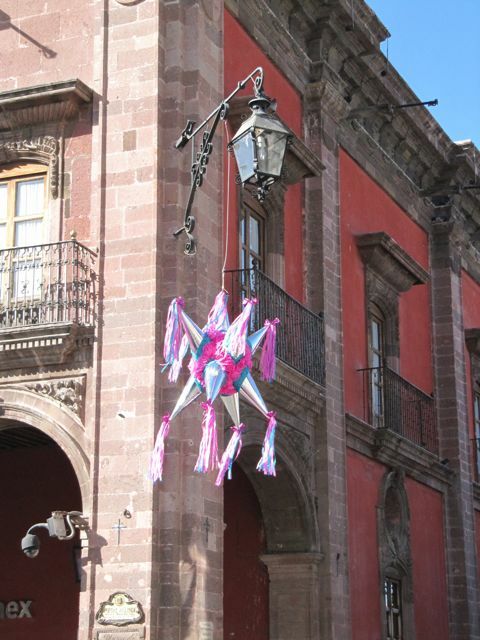 I’ve learned about the peninsulares, those living in Mexico who had been born in Spain. They were the wealthiest and held positions of power. When peninsulare women found out they were pregnant, if they could, they’d hop the next ship back to Spain so that their children could be born in the home country and thus enjoy all of the advantages that came with that distinction. 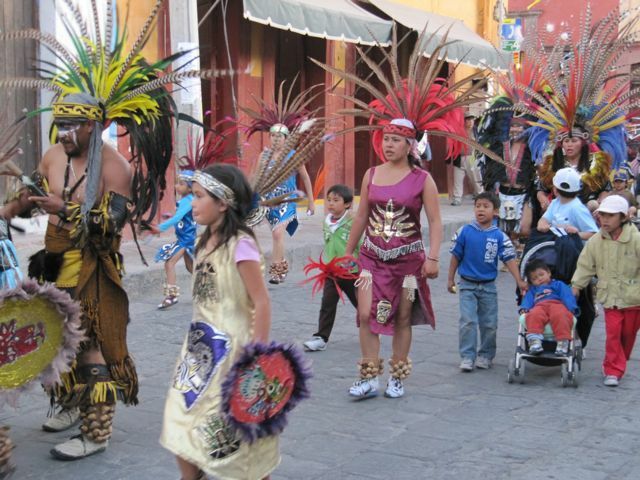 Then came the criollas, the children of Spaniards, but born in Mexico. Then there were mestizos, the children of marriages between Europeans and indigenous people, and then the Indios, the indigenous themselves. Next up was the toy museum, which is new this year. The street it’s on, Nuñez, is the next parallel one to the one I lived on during December, Animas. The address I was looking for was #40. Where I hit Nuñez, I saw 33 and 35, then looked in vain on the opposite side of the street for #40. I ducked into a computer school to ask where the museum was, and was told it was several blocks up. When I went back outside, I saw that immediately next to #35, there was #2 and the numbers climbed from there, and I easily found #40. But to have both odd and even numbers on the same side? And to have 2 come after 35? There are many mysteries. I’ll bet lots of folks go into that school to ask for directions. 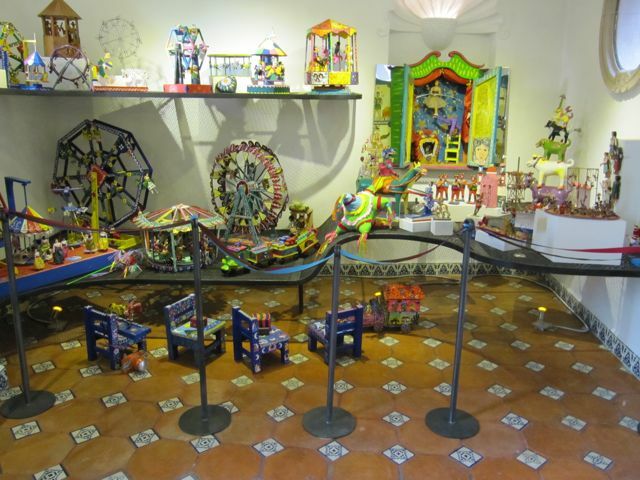 The toys in the museum are the collection of a single woman. The building housing them is bright and light and beautiful; it was a former home. 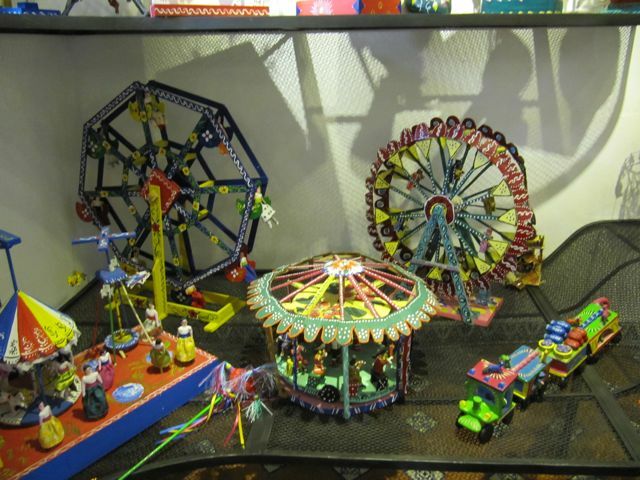 It’s not a Please Touch museum, however, and I could imagine that for a child, it would be very frustrating to have the glorious, riotously colored toys right at hand, but not be able to touch them or play with them. There was a guard, who turned out to be a municipal police officer, who was wearing a gun. I was horrified by this, and asked her why, in a toy museum, populated mostly by families with children, it was felt a necessity to have a guard with a gun. She explained that she is a municipal police officer and if necessary, could be called outside to deal with whatever situation presented itself. We talked to several people working at the museum to express our reaction to this. I’m guessing that the museum can’t afford a guard and thus an officer is assigned by the city to the museum. Hopefully, they will have a guard without a gun someday soon. I had another session with Mercedes and her three nieces and nephews, and we read Goldilocks and the Three Bears. I would read it out loud in English, pausing to point out slang, idioms, whatever I felt needed additional explanation, and Mercedes would translate it into Spanish for the kids. Periodically, I would stop and ask them questions about the story in Spanish to test their comprehension. It was a good session and the first time they’d ever heard the story. It is not popular in Mexico. I had to cancel our Thursday session, because Sandy and I had tickets to a flamenco show. There were 12 in the troupe: four dancers, three guitarists, a couple of percussionists, and some “palmas” (rhythm clappers) from Mexico, Spain, and Brazil. The place was packed, and the show was extraordinary. I am a real fan of flamenco, and had my interest re-ignited on my trip to Spain last fall. On New Year’s Eve afternoon, I received an unexpected invitation to a dinner party from friends of Sandy’s. There were nine of us and the house, wine, food, and company were marvelous. I had a good time. 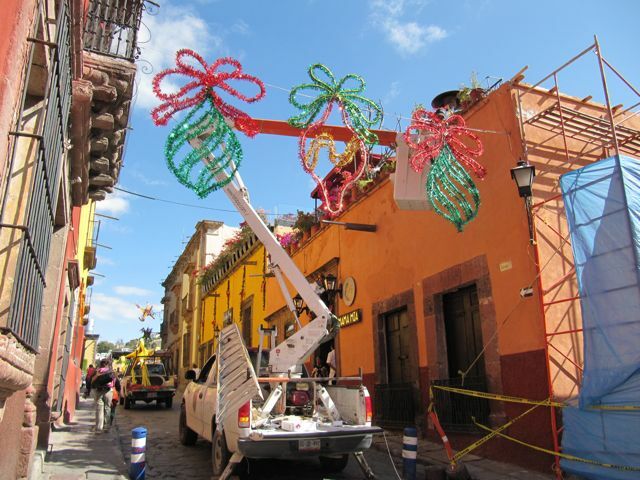 A light and sound show was produced for illuminating the parroquia for the bicentennial in September 2010. It proved to be so popular that it was brought back for the holiday season. I have now seen it three times but have failed every time to get any photos. It’s very frustrating because I’ve used every setting I could think of, with the flash on and off. This is an extremely sophisticated show (Disney-esque, it’s not). 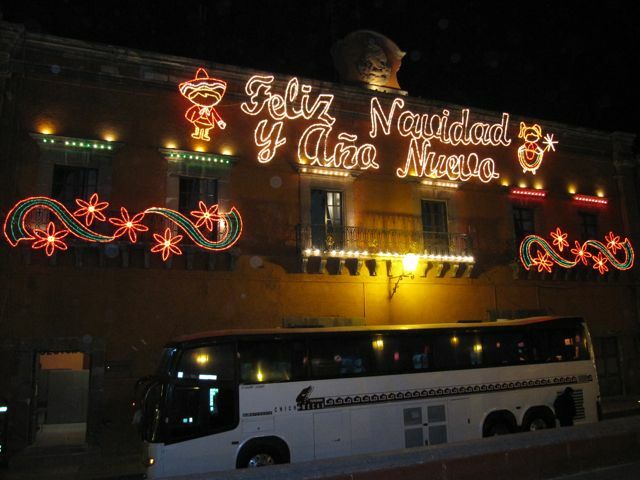 It ends with “Viva Mexico” projected on the parroquia; now it says “Feliz Navidad.” Huge crowds gather to watch it. On New Year’s Day, I moved to a new dwelling for the remainder of my time here. The story of why I’m in two different places during my stay is way too long to go into here, but finally, in my third year here, I am in the building I want to be in. It’s right next door to where I rented last year, and I have the same landlady. I had three suitcases, three plastic bags, and my backpack to move. Since this new apartment is on the third floor, I asked the cab driver if there were parking available if he would carry my heavy suitcase up for me. Because it was a holiday, there was parking, and he did. As we entered the complex, we were met by my landlady, Heather, my maid from last year, Reyna, who will also be helping me out this year, and Sandy. What a welcoming committee! All helped to carry my stuff up. Heather left me two bottles of wine and one of champagne, and about 10 pounds of fruit of all kinds, already disinfected. Being a third-floor apartment, it is flooded with light and is delightfully warm. 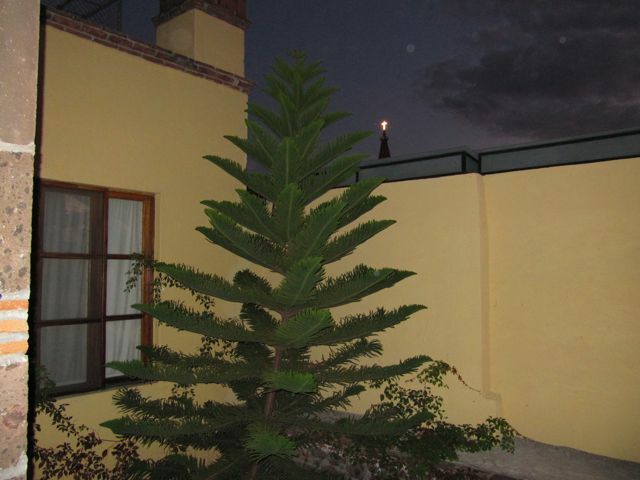 There is a tiny balcony off of the bedroom with a view of a four-story tall Norfolk Island pine. I’ve never seen one that tall or in such pristine condition. 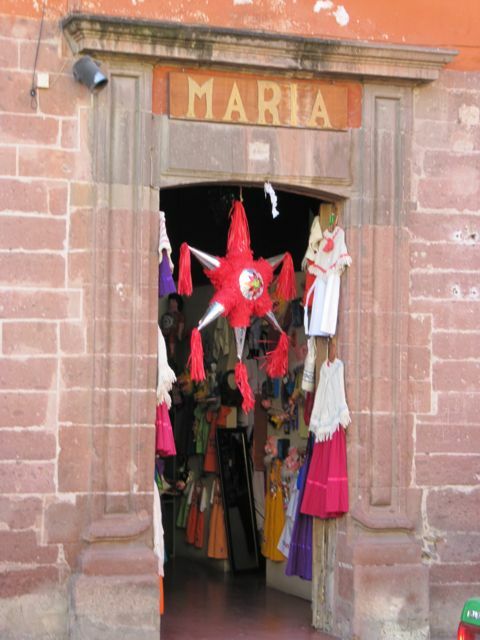 I can also see the tippy-top of the parroquia with its cross. I can also go up the huge terrace on the fourth level, which is for anyone on my side of the complex to use, but Heather said she’s never seen anyone up there. There is a clothesline there, too, so that’s where I’ll hang my laundry. There are also a table and chairs, several chaise lounges, and we’re working on an umbrella. 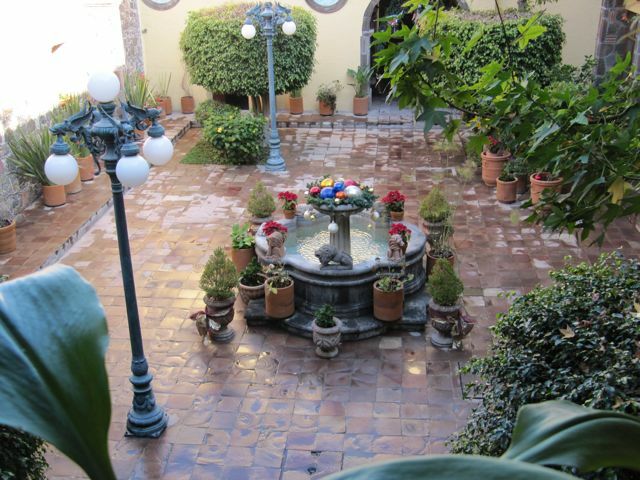 The place has a stunning central courtyard with fountain, now lavishly decorated for Christmas. I know several of the other people in the building. It’s extremely centrally located, and it’s the perfect spot for me. My apartment is the one to the far right on the top floor (with the uneven shades). My little balcony, that I just love. And what I look out on at night from that balcony. It doesn’t look it here in the photo, but this is a king bed. 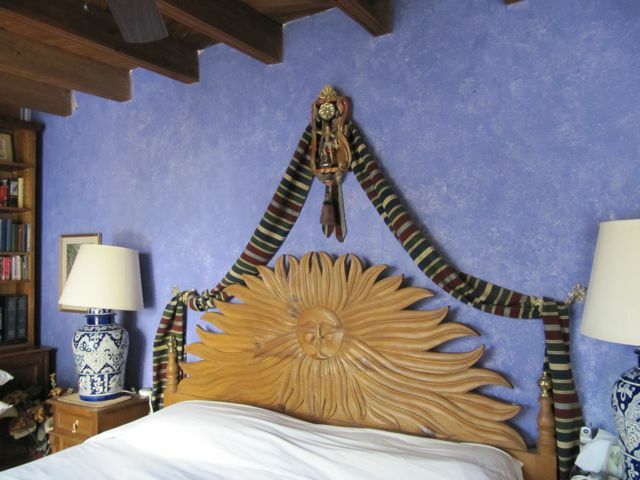 I think the headboard is stunning. The draped material was left over from when the sofas were re-covered. Very attractive, no? Among the fruits that Heather left me were six golden delicious apples, not my favorite, so, in a fit of domesticity, I made applesauce. I had no cinnamon, but used some craisins I had on hand, plus a little sugar, and the result was delicioso! I ate about four tablespoons of the stuff right out of the pan while it was still hot! Then I made up a half gallon of jamaica, which is a tea brewed from dried hibiscus blossoms. I was served this deep, deep red brew at a fund-raiser last year, and was immediately hooked. I had it again this year, made with cinnamon and a little cloves, but I prefer it straight with just a touch of honey. It’s delicious either hot or cold — and such a splendid color! Of course, when I offered some to Carlos, my Spanish teacher, he told me it’s a diuretic and should be consumed within a day after making it. Mine has been in the fridge for three or four days. Sigh. I liked this guy’s spirit. 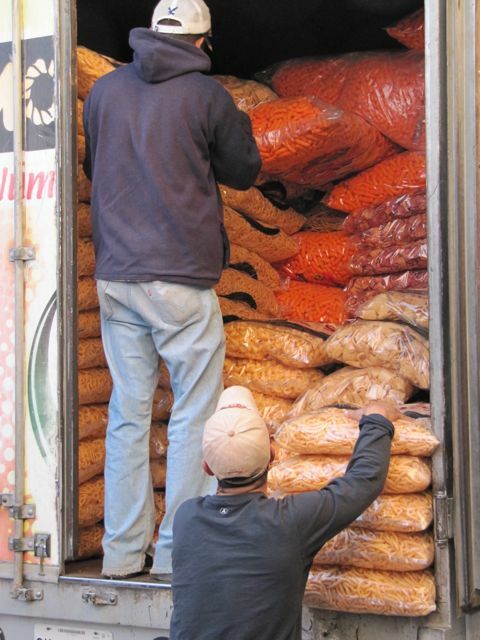 This is an entire truck filled with gargantuan bags of cheese curls and potato chips, which the Mexicans love. This clown was big on audience participation and chose four stunning-looking young men and an equally gorgeous young woman to help him out. Kept everyone’s attention riveted on his act. 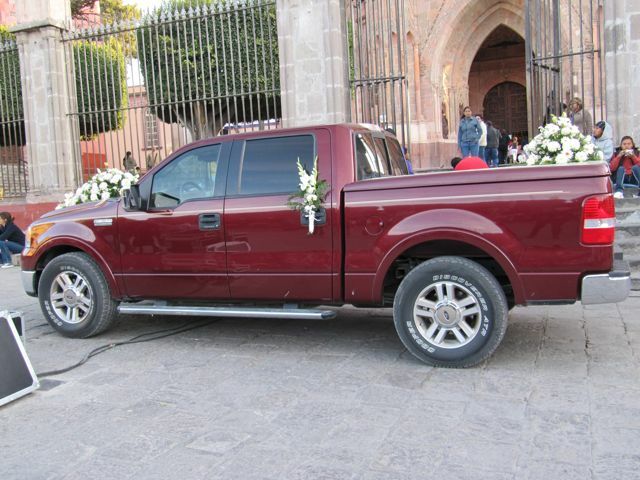 I’ve never seen a truck used for the newlyweds’ getaway car, but why not. 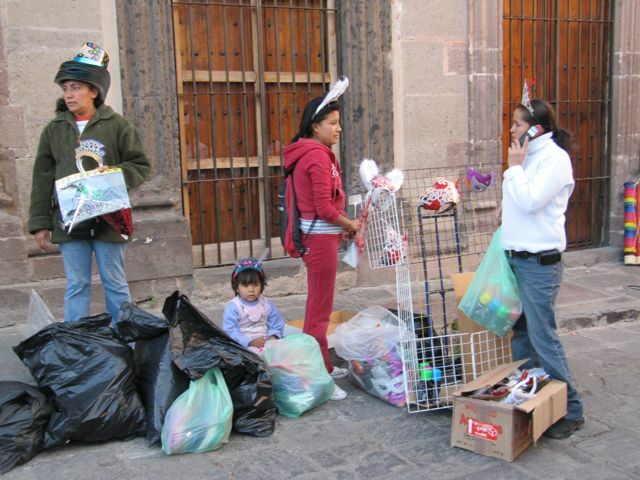 These enterprising young women were setting up to sell New Year’s Eve party hats. This will give you an idea of the mobs that are in town. The line in the foreground is to purchase an ice cream cone. 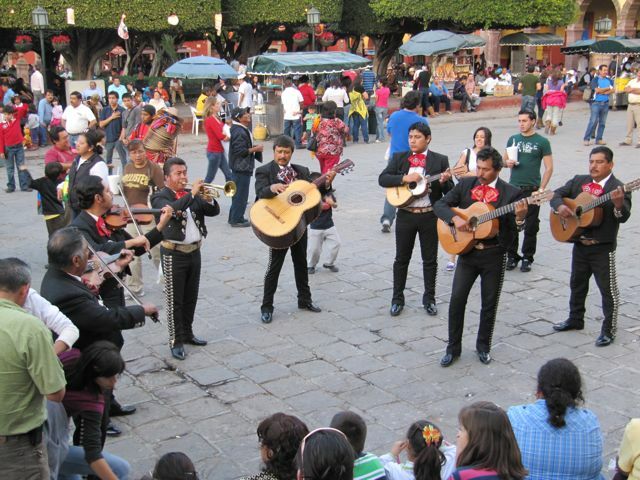 And the mariachi were out in force. This is a corner right down from my apartment. You can see my street sign (Mesones = hotels). A spontaneous dance party had formed. I have to say: these folks know how to have fun! Almost every part of the move between my two rentals went smoothly, except that I was unable to remove my yoga DVD from the DVD player at the first rental. I had inserted it the first day and played it faithfully every morning, never needing to remove it. Mari, my maid there, and I tried to remove it together with no luck. She promised to tell Delfino, a rep of the management company, about it on Monday. (The day I moved was New Year’s Day, so obviously no one was working that day.) After a few days, when I hadn’t heard anything from Delfino, I called the management office and spoke to Maribel, who said she was going to the house the next morning on another matter and would look into the DVD problem. When I didn’t hear back from her in two days, I called again. She said she had gone to the house and tried herself to get it out, to no avail, and that an electrician was going that very morning at 10 to work on it, and she’d get back to me. Of course I’ve heard nothing. If I get it back and it’s playable, I’ll be very surprised. But I’m remarkably calm about it. I miss doing my yoga each morning, but I re-arranged one of my two weekly Spanish lessons so that I could attend yoga with Alejandro on Thursdays on the dance floor at Arthur Murray until another site for the classes on Mondays, Wednesdays, and Fridays can be arranged. I can always order another DVD online, have it sent to Suji, and ask her to bring it down with them mid-Feb.
And speaking of Alejandro, I went to a party at his and his partner’s home one evening last week. It was given for several reasons: for Three Kings’ Day, January 6; to welcome back a woman who had taught yoga with him last year, and who had just returned from the States and successful surgery for a brain tumor; and to kick off a new season of yoga with the snowbirds. I got there about one and a half hours late, as I wanted to keep my appointment with Mercedes and the children. It was in a neighborhood I’d never been in -– pretty far out, so I took a cab – and they live in a gorgeous, rented house with a large patio. He had catered finger food and lots of wine. Soon after I got there, a huge pizza-like box was delivered, but it wasn’t pizza, but rather rosca. 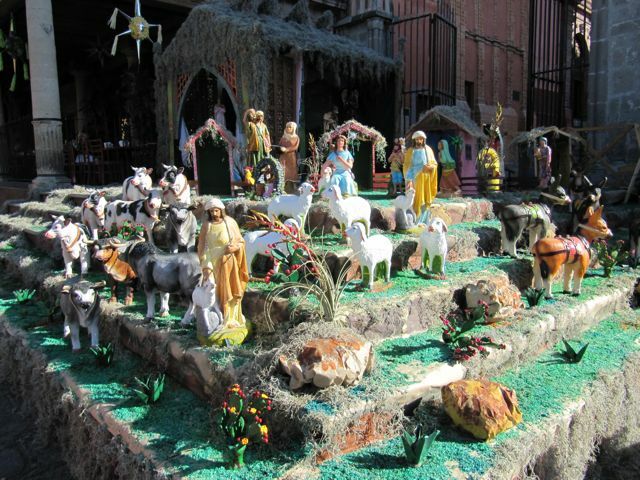 Rosca is a special bread, prepared only on Three Kings’ Day, in hundreds of shapes and sizes, in which has been baked a teeny, tiny plastic baby Jesus. 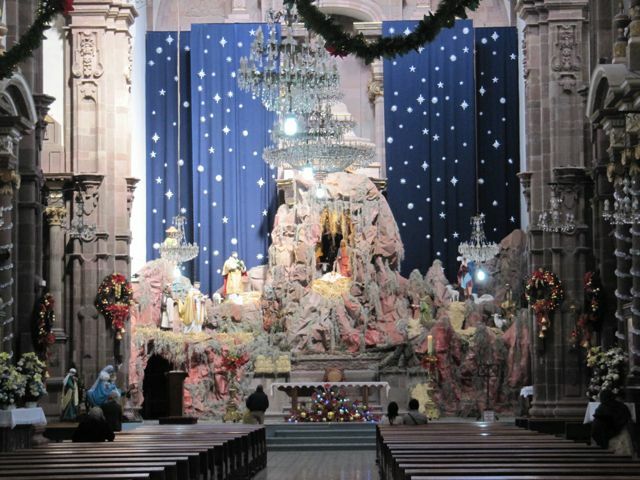 The tradition is that whoever gets the baby Jesus in his or her slice has to throw a party on Candelaria, February 1, providing tamales and atole, a corn drink, for all those at this party. I’d be scared to either break a tooth or swallow baby Jesus, so I was pleased that a man in my yoga class and his wife got it. Alas, on January 6, when I went over to Mercedes’ house for our session, I found out that the girls did not receive the hoped-for boots. They were both wearing lovely new clothes, however, and seemed happy. They were also very tired. 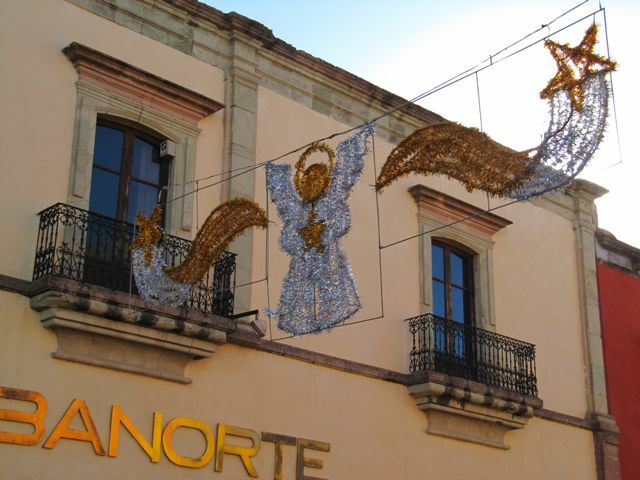 Mercedes told me that kids in Mexico don’t sleep much on the night before Three Kings’ Day. 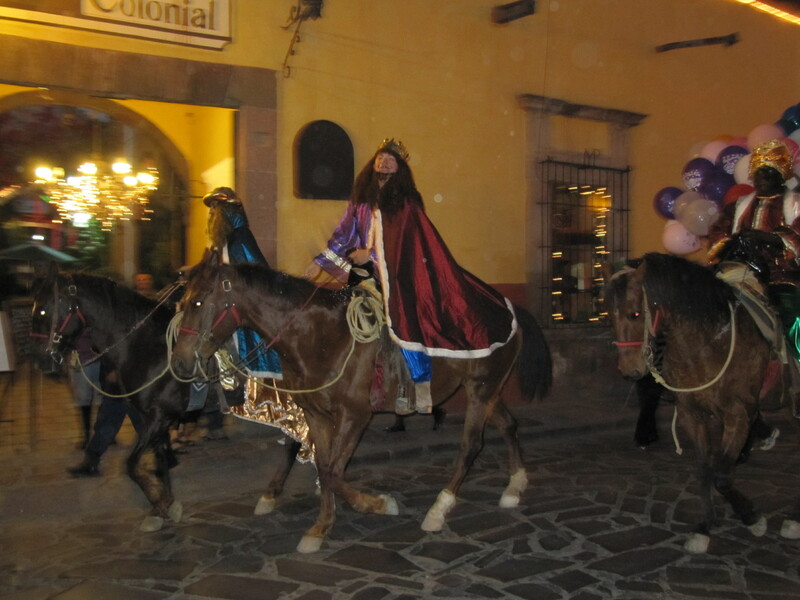 These are the three kings, part of a parade on the eve of Three Kings’ Day. I was on my way somewhere and suddenly the parade appeared and I couldn’t get my camera out fast enough to get any shots of them but this one. 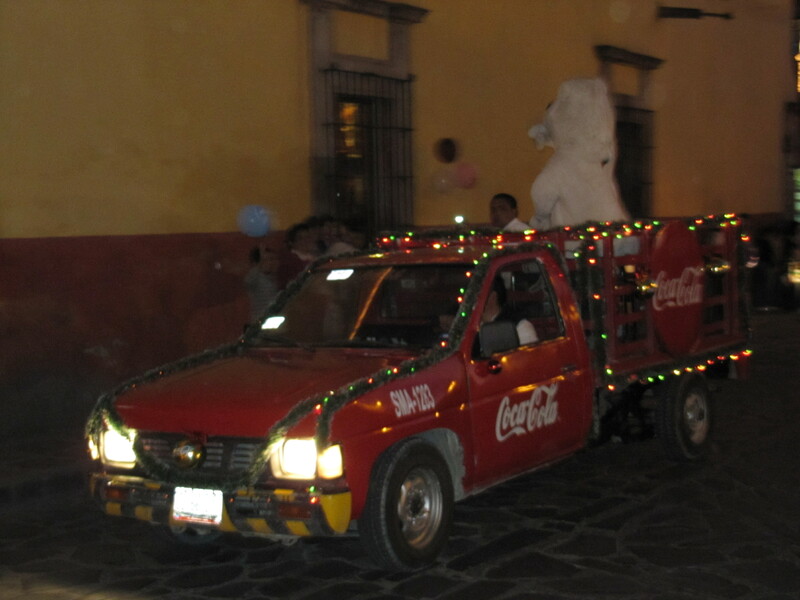 And here is a sponsor’s truck, I guess, as part of the parade. Everything in the USA has a corporate sponsor, so why not here? More Coca-Cola is consumed in Mexico per capita than in any other country. Here’s a run-down on a recent morning of mine: Javier, wearing his plumber’s hat, is due at 9 a.m., so I’m sure to be up, dressed, exercised, fed, bathroom stripped of most things, as he’s going to be doing some major plumbing work there, and will need to turn the water off for at least three hours. He and his father have already been in my apartment for a full day earlier in the week (with the water turned off only briefly). Now I know why Mexican houses – at least those owned and rented by gringos – have so many bathrooms; it’s because at least one is under repair at any given time. It’s 10 a.m. and still no Javier, so I prepare to go out to buy Atención and some fruits (Javier has keys to my apt. and is totally trustworthy). The doorbell rings; I think it’s Javier at last, but no, it’s the flower lady. This woman comes on Tuesdays and Fridays, carrying many bunches of flowers and stops at each apartment in the complex to see if anyone wants to buy. Sandy directed her up to me. Fulfilling a promise to myself to always have fresh flowers in the house while I’m down here, and because she is so charming and persuasive, I buy two bunches. Of course that means that now I have to abandon my plan of going out in order to arrange the flowers. I find some vases, start clipping long stems, and almost immediately, the ultra-cheap scissors break, so now I have to stop arranging, fill the vases and the sink with water because soon Javier will come and turn it off. As I’m doing this, Javier arrives, and I leave to buy some scissors as well as fruits and Atención. I’m successful except for Atención, and return to the apartment. I can’t disinfect the fruits because there’s no water. I use my new, supposedly stronger scissors to cut the stems of the flowers I have bought and arrange them around the apartment. 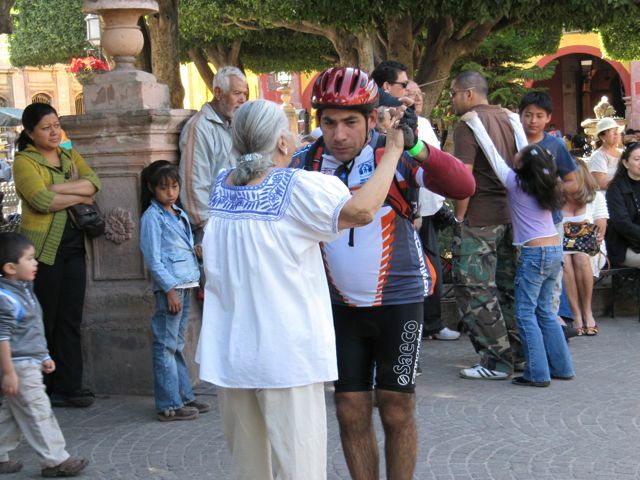 Now it’s time to go out front to wait for a ride to Ojalá Niños. More on this later. Another morning, a few days earlier, I was awakened at seven by the most ungodly mechanical screaming noise I’ve ever heard. I traced the sound to a silver cylinder above the washing machine. There was absolutely nothing I could do, because I didn’t know what the cylinder was and I couldn’t reach up that high anyway. My landlady, Heather, who lives directly under me, called to say that there was no water because the pump on the roof had malfunctioned and that the pump in my apartment – the silver cylinder and part of the water purification system – was screaming its outrage at not having any water being pumped into it. “Saint” Javier appeared within about 15 minutes, checked on my apartment and then got up onto the roof, and fixed whatever was ailing the pump PDQ. Then he came back to my apartment to check on another noise the pump was making. I was grateful that that sound didn’t happen in the middle of the night, and Heather was grateful that she didn’t need to put out another 9000 pesos for a new pump. One day, I saw a workman with an orange safety vest and a yellow hard hat, obviously either going to work or returning home (at 1:30 p.m. on a Sunday, I have no idea which), and in addition to his work clothes he was wearing a lavender Tinkerbell backpack with the words, “Follow the Pixie Dust.” I found this just hilarious, but I guess a backpack is a backpack when you need one. I have decided that this year, I will not sign on to any regular volunteer position, but rather wait to see what needs present themselves and help out on an ad hoc basis. Of course this does not include the twice-weekly visits to the home of my now-former neighbor, Mercedes and her nieces and nephew, to teach English and learn Spanish; being on the welcome committee at UUFSMA, greeting folks and giving out orders of service each Sunday; and taking over a small (or so I was told; I’ll let you know) weekly administrative task for Ojalá Niños, which can be done completely on the computer, while the woman who usually does it travels to Ecuador. Ojalá Niños is the after-school program in San Miguel Viejo, an extremely poor “suburb” of SMA, where I taught English last year. (It was for this group that I helped fill the Christmas bags, as I reported some time ago). I was invited to help out at a thank you luncheon for the 42 mothers of the kids in the program who had provided snacks for the kids since last October. The program meets on Wednesdays. with classes in art, music, dancing, and English for about 125 kids. 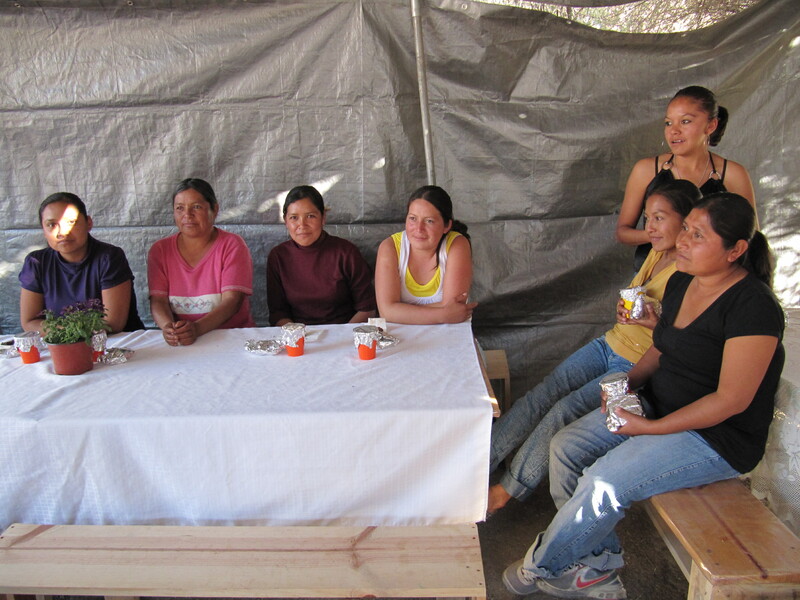 Volunteers – mostly gringos – staff these classes, and brought healthy snacks for the kids. Elsmarie, the amazing woman who started this program in her home, thought that providing snacks was something the mothers of the kids could do that would help to organize them. (The people in this community are not united in any way, and Elsmarie, a sort of one-woman Peace Corps, is determined to get them organized for their own well-being. There are many issues in which having an intact, organized, and vocal community could stand the people in good stead.) Well, the whole idea of simple, healthy snacks ballooned and the mamas started doing major cooking and bringing comida for all the kids – a huge undertaking. So, in thanks to them for their labors of love, we threw them a luncheon where we prepared all of the food and served them at nicely set and decorated tables outside in the shade – an experience Elsmarie is sure they’ve never had before. 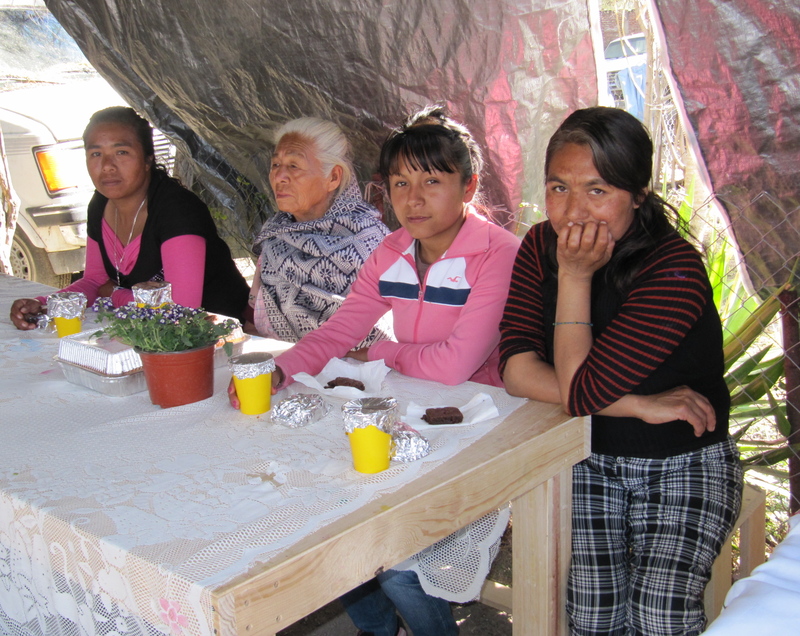 Of the 42 women who received an invitation, 24 arrived and seemed to enjoy themselves. Of course, we had prepared food for 42 women, plus the 12 or so volunteers, so after the lunch we packed up lots of lasagna and salad for the women to take home. I participated by going two hours early to help set up and chop veggies. Then I helped to serve the women and clean up. I was on my feet for much of four hours, had a lovely lunch and a chance to interact with women that I would probably never meet in any other way, as our lives are so completely different. I also got to meet again a couple of the students I taught in my English class last year. They had grown! And they remembered me. It was a poignant moment. The next several pictures are of all the mamas at the party. 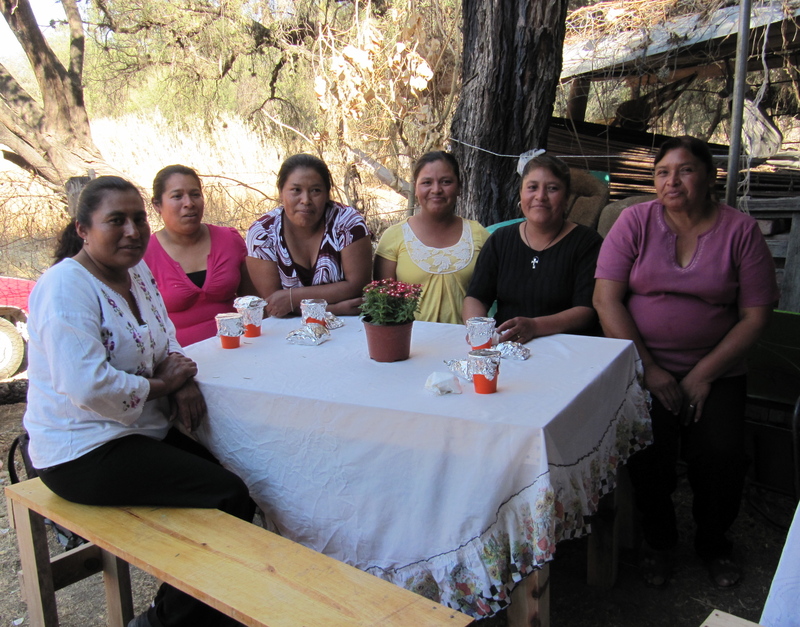 The three women in the forefront of this photo, on the right, are sisters, and there are 17 more brothers and sisters in their family. Twenty children! Yikes! 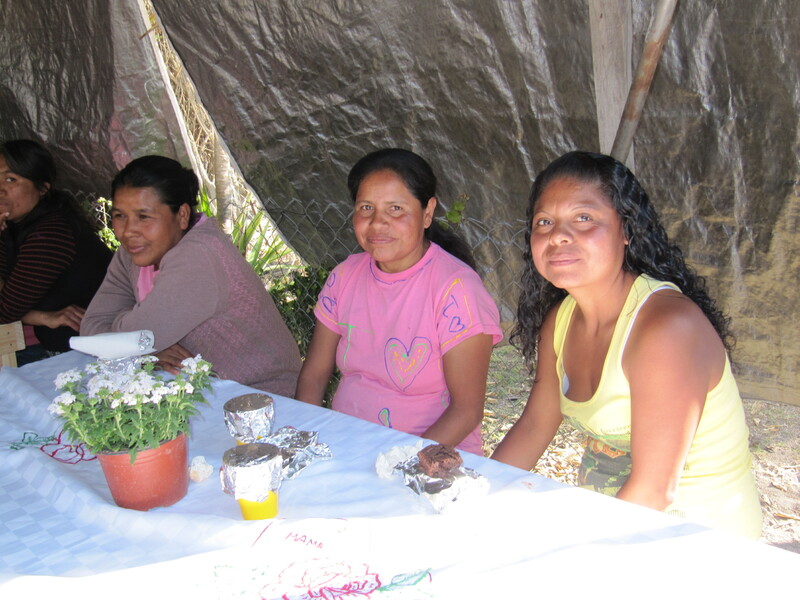 The party for the mothers also marked the end of the big weekly meals they were preparing. It had been decided that only on the last Wednesday of each month would there be snacks after the classes and that time would be used to celebrate the birthday of any children born in that month. This will give the classes more time to finish their projects, as they were having to dismiss early in order to accommodate the eating. 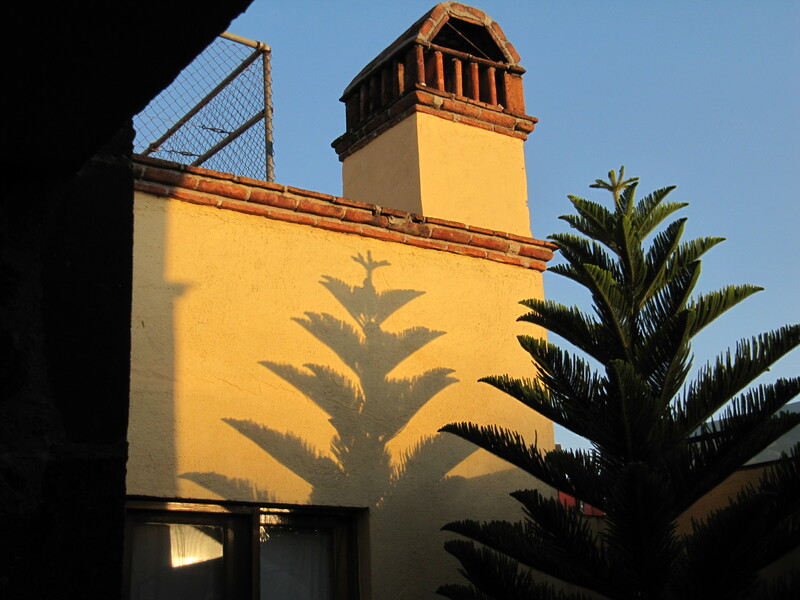 At a certain time of day, this shadow appears on the wall opposite my little balcony, adding to the beauty of what I look at there. Interestingly, it starts out low and as the sun sets, the tree’s shadow grows. At Times My Apartment is Like Grand Central Station! You will remember the water pump problem of a week or so ago. Even though Javier thought he had fixed it, water continued to drip from it, happily just into a utility sink. He concluded that the seals were compromised when the pump tried to work with too little water. So he and his father, who helps him out, returned to my apartment just before I had to go to yoga. Javier stopped in downstairs to talk to my landlady, Heather, and sent his father up with the tools. His father suffered some kind of brain damage at some point in his life, and so he is compromised. The father was just standing in my hall, waiting, so I invited him to sit in my LR, and of course I had to try to converse with him a little. He is missing almost all of his teeth, so when he did speak, I had trouble understanding him. It was a long five minutes or so. I left him still sitting there when I went to yoga. 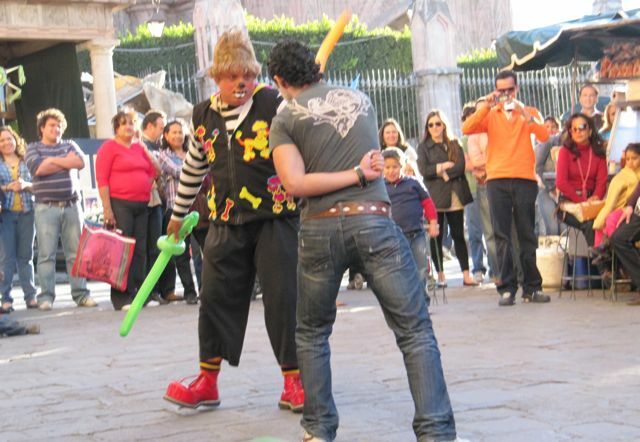 When I returned, both Javier and his father were still there, but were just finishing up with the pump. Soon Reyna, my maid, arrived for her twice-weekly visit. And soon after that, again my doorbell rang, but it was just a friend of Reyna’s — probably another maid or she wouldn’t have been able to get into the complex — who had some quick business with her. 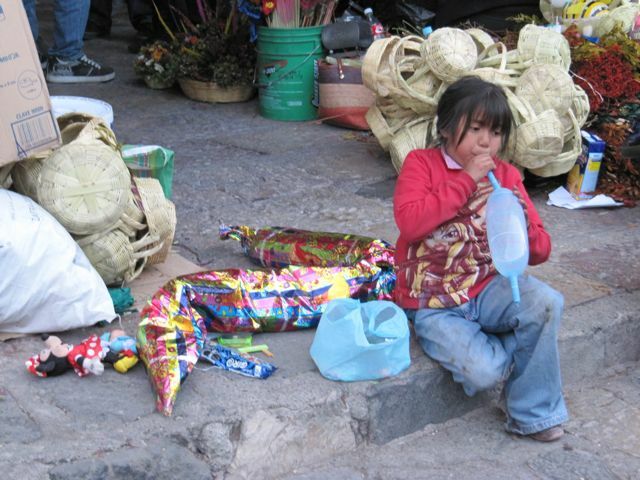 I needed a new garrafón (five-gallon bottle of purified water), so I gave Reyna the necessary 20 pesos and asked her to get Reuben, the mozo or general factotum for the complex, to bring a new one up. I had a few other problems in the apartment, like not being able to turn on one of the gas heaters – which had not been necessary until today, when it turned quite cold again – and a lamp was not working. So Javier got to work on the lamp when Reuben came up with the garrafón. So now I had four people working in my apartment! Then the outside doorbell rang, and it was Delfino from the management company of the house I rented in Dec. with my yoga DVD in hand, that I – and many other people—were not able to get out of the DVD player when I left there. What a pleasant surprise. We’ll see tomorrow when I do my yoga practice if the DVD is playable. (Later report: It is in perfect working order!) Really, I had just about written it off entirely, thinking I’d never see it again. I need to be more patient and give these things time. I wasn’t able to get washed and change out of my yoga clothes before Carlos arrived for my Spanish lesson because there was just too much activity in my place. I did manage to eat a quick lunch on my balcony to keep out of Reyna’s way. You know, telling of all these things happening to me and in my apt. makes for a good story and a laugh. I wonder, though, if, over the long haul, they would become tiresome nuisances. I remember wondering about that last year, too. 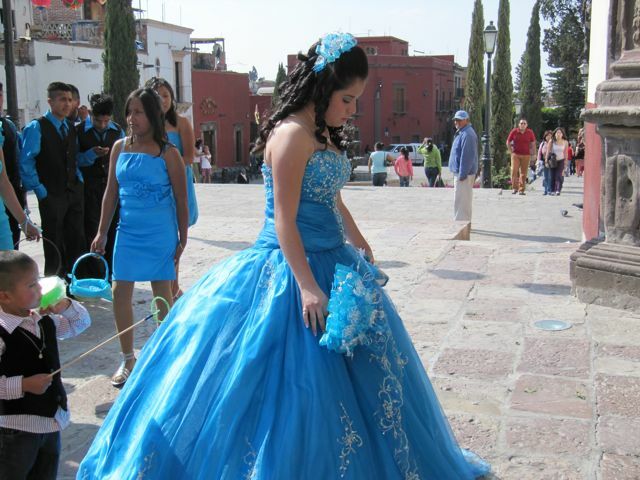 The time is going too fast. I have now been here for over 6 weeks, and it does not seem possible. I have also been extremely healthy. I have not had so much as a tummy rumble during that time. Plus many around me have had la gripe, but not I. I am extremely careful with what and where I eat, and obsessively wash my hands. Also, I am sleeping fantastically well here, like never before in my life that I can remember. I don’t know what to thank for the incredible amount and quality of sleep I am getting, but I think it may have something to do with the altitude. Also, some problems and pain I was experiencing at home with my degenerative spine have totally stopped. Again, what is the cause: more frequent yoga classes? Holding the poses an unbelievable amount of time, as we do in my class here, far different from at home? Lack of humidity? The altitude again? Or some of each? Dawn from my balcony. It’s so beautiful at any time of the day. And speaking of altitude, the other night, I wanted to make pasta with pesto, and it took me a total of 45 minutes to bring the water to a boil and then to cook the pasta. It was my first experience with boiling water at a high altitude. I understand that baking is a real challenge here, too, because of it, but I don’t have to worry about that. I won’t be doing any baking here. There are too many good bakeries all around. During the holiday period, the show “Grease” was in town — in Spanish, of course — and it’s called “Vaselina.” Loved that. The kids are now back in school and the Mexican tourists have all gone home. We gringos are happy to have “our” town back. It was just too crowded. Recently I caused a minor disaster. 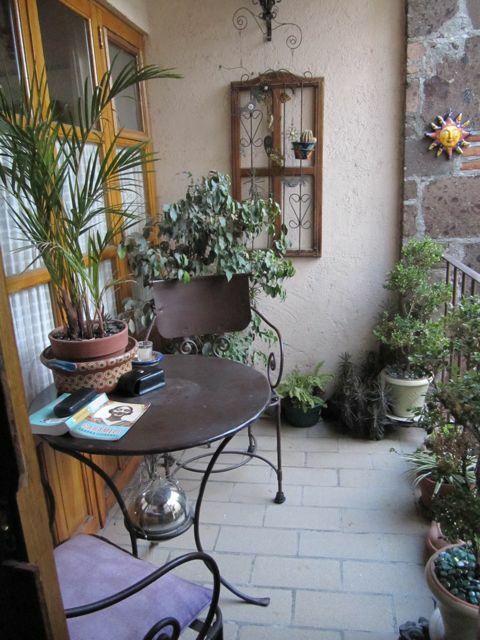 Up on the fourth floor terrace, there is a wrought iron table with a circular glass cover. It’s impossible to be up there mid-day without an umbrella because the sun is so strong, so Heather hired Javier’s brother to bring in a special tool that sprays water while cutting a circular hole in the glass; the water keeps the glass from breaking. Heather gave me an umbrella and up I went to put it in place. I decided not to leave the umbrella in the table after I put it down, but rather to store it on the landing with the cushions for the lounge chairs. Unfortunately, the top-heavy upper part of the umbrella slipped when I was trying to disengage it from the pole. It hit the glass and caused two cracks to form from the center hole out to the edges. I was pretty hysterical, as you can imagine. I immediately told Heather and said I’d pay for a new sheet of glass and the cutting of another hole. She told me where I could go to make that happen, but I decided that my Spanish was not up to that task, so I will ask Javier to do it . Sigh. I told Heather that I will never again use the umbrella because it’s just too easy to lose control of it and cause another round of cracks. 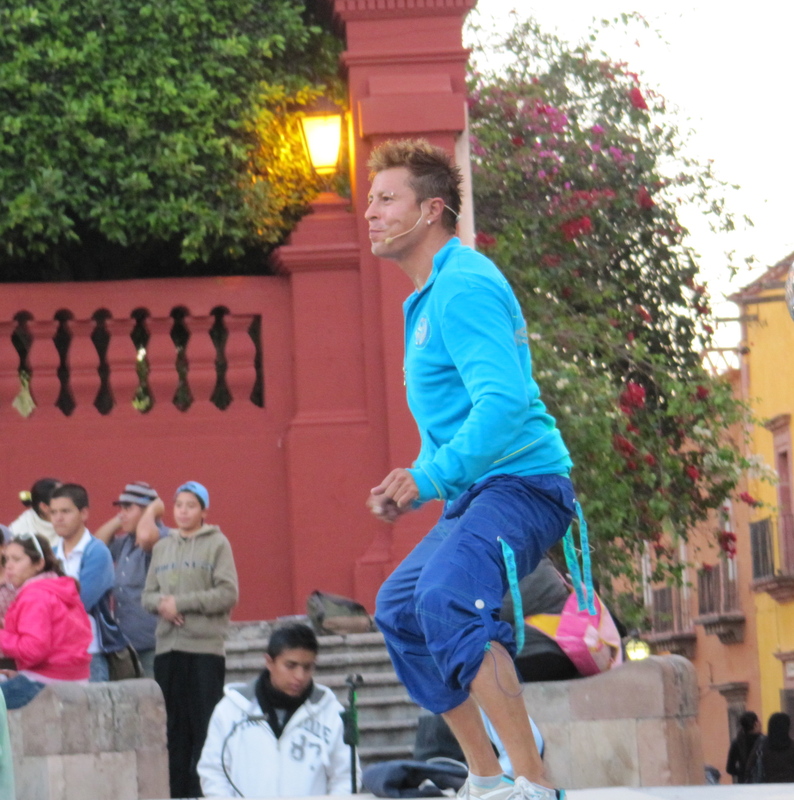 While walking to dinner the other night to meet a new friend I’ve made here, I passed through the jardin and what should I encounter but hundreds of (mostly) women doing Zumba to ear-shatteringly loud music while following the instructions of a man up on a stage. 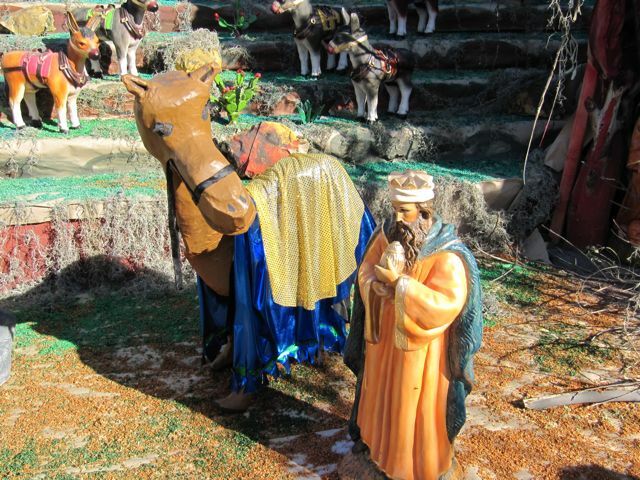 The 50 peso entrance fee was to fund a religious pilgrimage of some sort. I am crazy busy. Last Friday was the first meeting of the weekly short story discussion group I am in. This past week also was the Jewish Film Festival, so I attended five movies in addition to all of the other things I do each week. There was a lot of confusion as to what languages the movies and sub-titles were in, because they were listed one way in Atención and another in the official festival program (which was only in Spanish). Because of this confusion, they put up a chart in the box office with the correct information. In spite of this, I wound up at a movie in French with Spanish sub-titles. I decided to stick it out, and I was able to read the sub-titles, except that they flashed on and off too quickly. I don’t think I could tell you the plot of the movie, but I felt it was a good exercise anyway. 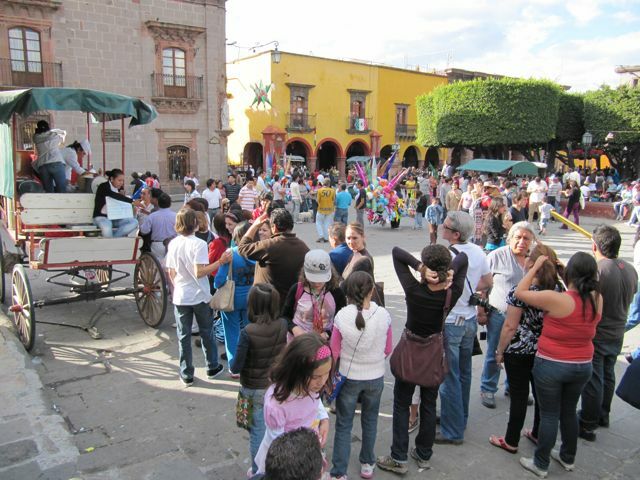 Oddly enough, the festival was poorly attended, and I don’t know why, as there is a large Jewish gringo presence here (not sure of the extent in the Mexican population), unless it was partially because of the confusion as to languages. Maybe also people don’t want to go inside when the weather is warm and sunny. 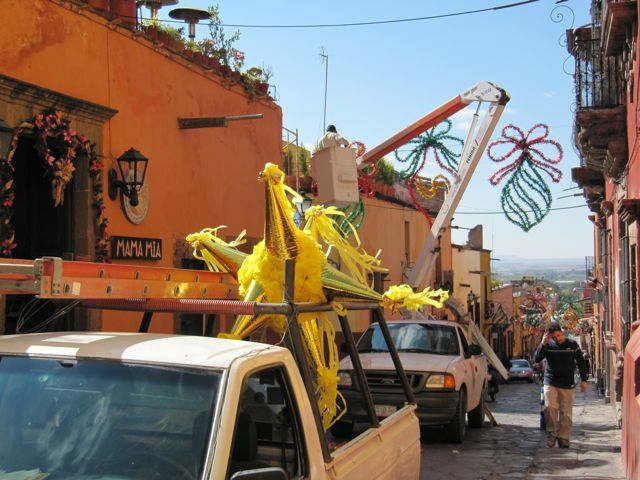 While this festival has been in other cities in Mexico for nine years, it was the first time in San Miguel. And next week is the third Annual Indian Film Festival! 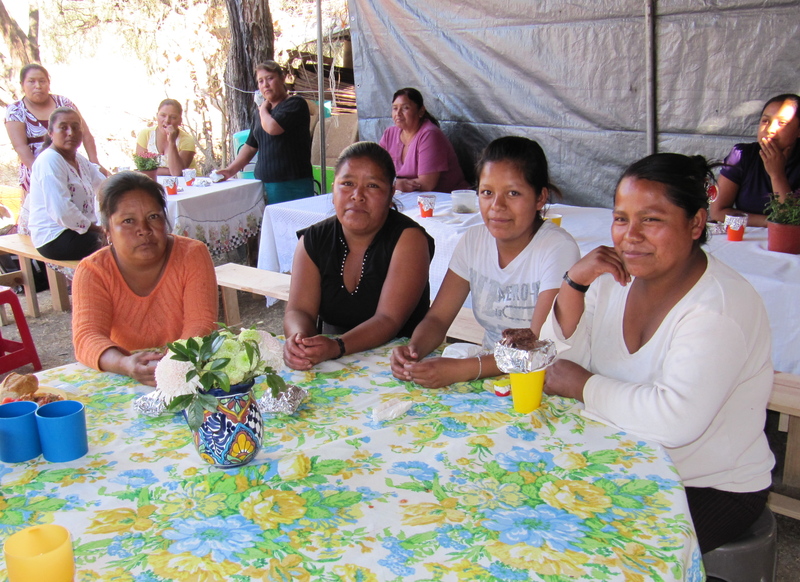 This past week, I also met two women visiting San Miguel for short periods of time who were referred to me by my sister and a woman I met here last year who is not coming this year. I met Sybille from Taos for lunch and Paula from Bethesda, MD, for dinner. I’ll be attending a play with Sybille and her husband later this week, and then they’ll come back to my place for dessert. There’s a lot of this kind of friend-making here, and it’s fun. I continue my twice-weekly sessions with Mercedes and her two nieces, and my time with them has become a very cherished part of my week. Alicia has a repaired cleft palate and wears braces (called the English word “brackets” here), so it is extremely difficult for me to understand her and she has trouble saying some of the English words I’m teaching them. We do a lot of singing and dancing (The Farmer in the Dell; Hokey Pokey; Head, Shoulders, Knees and Toes; One Little, Two Little, Three Little Indians, etc.) This week I’m going to teach them The Itsy Bitsy Spider and The Wheels on the Bus. I made a boo-boo the last time I was there that caused much hilarity. As I was leaving, with Mercedes seeing me to the door, instead of saying, “Hasta miercoles” (goodbye) until (next) Wednesday, I said, ”Hasta Mercedes. “ What a wonderful laugh she and I shared; it was a special moment. From left to right, we have Alicia, Diana, and Mercedes. After a lot of thinking and admittedly some hesitation (for reasons I was not able to identify for myself), I have decided to rent here in the fall for three months. I’ll be in the apartment next door that I stayed in last year for Sept. and Oct. and in this apartment for Nov. It’s broken up like that because both apartments are already rented for different periods of time. I want to experience SMA in a different season. Supposedly fall has the absolute best weather (although I don’t know how anything could be better than it is now) and there is a profusion of flowers because of the summer rainy season. 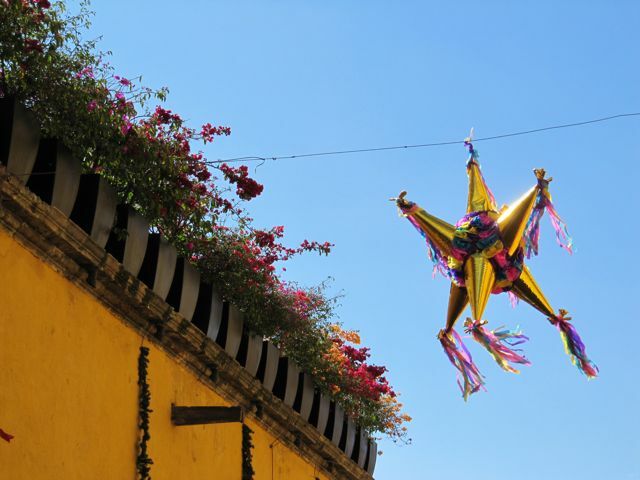 Sept. is filled with Mexican fiestas of all kinds, and there is a Cervantes Festival, which has a wealth of cultural opportunities. 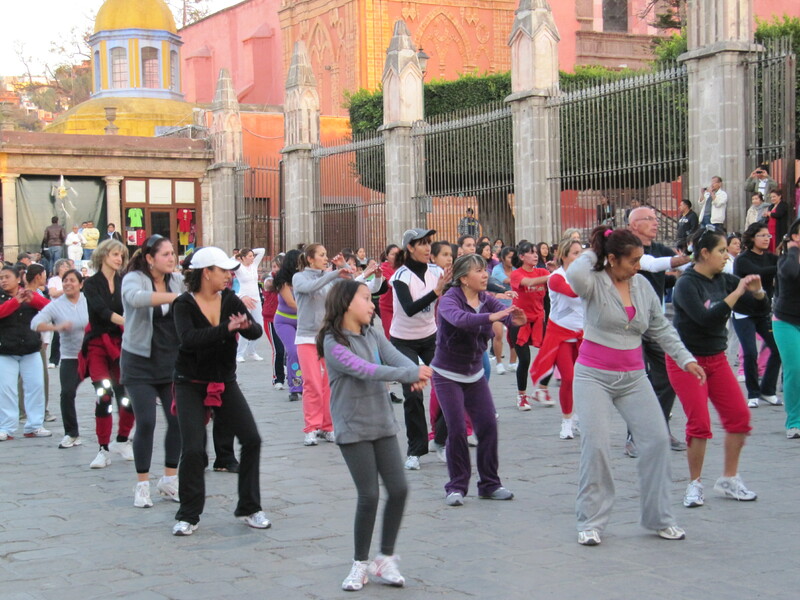 I’ll do my yoga, have my Spanish classes, volunteer, and enjoy the less-crowded atmosphere. In Dec., I’ll go home for six weeks to celebrate the holidays with the visiting Finns and Suji and Geoff, and then return here on Jan.15,2011 for the rest of the winter. The fall is a good time to leave my house un-attended, as the garden won’t need watering anymore, there will be no need for A/C or heat (except perhaps the last couple of weeks), and I can rake all of the fallen leaves in early Dec. rather than some each week. I have become very interested in the sound of three vendors’ voices, and it will challenge my writing skills to try to describe them for you, as capturing sounds with words is quite difficult. The first man has a small kiosk that he can somehow pack up and take away, on the corner near my apartment. He stocks and sells so many different things that it’s hard to believe. He periodically advertises maybe 8-10 of his products, always the same few (I think) very, very quickly in a loud voice. I have challenged myself to try to isolate some of the items. So far I’ve gotten Chiclets, cigarillos, and cacahuates (peanuts). 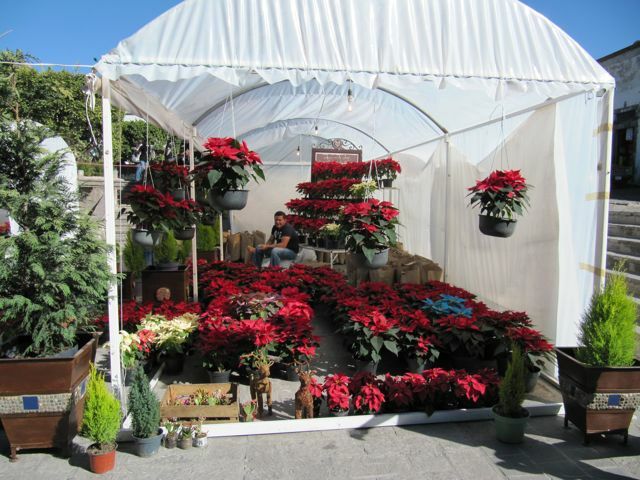 Another of the voices I love is from a huge man (in all directions) who sells newspapers in the jardin. He has a basso profundo voice which matches his girth and when he shouts his quite short pitch (I have yet to discern what it is he’s actually saying – perhaps “newspapers” – but I think I’d get that, or perhaps he names a few of the papers that are available), the sound seems to reverberate in the air after he’s finished. I’m thinking that under different circumstances, he’d be an opera singer. And the last hawker, who walks through the streets with his wares, seems to be on a rigid schedule because every single time I walk over to Mercedes’ house at a few minutes before 6 p.m., he is coming toward me on the same street. He has a completely different style than the other two men. He accents and elongates the final vowel of each food that he’s selling, even though the accent is not actually on the final syllable in any of the words, and in a voice loud enough to pierce the thick adobe walls of the homes to pique the interest of the housewives within to purchase his offerings. I’ve heard elote (corn on the cob), jicama, and cacahuates. I actually look forward to hearing his cry as I proceed to my intercambio. January 21 was Ignacio Allende’s 242nd birthday. 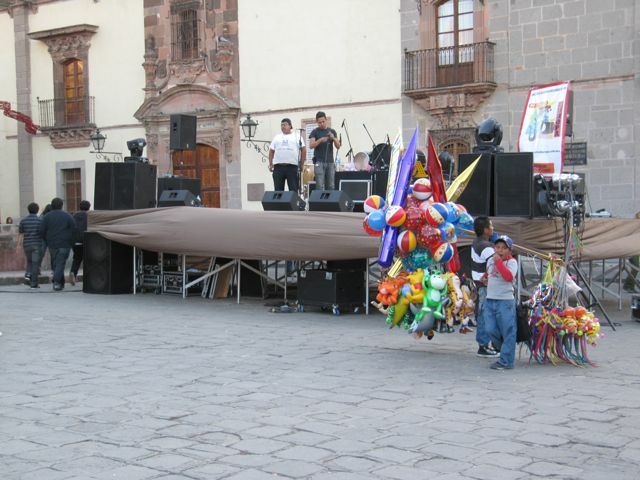 Although it is a holiday in all of Mexico, SMA does it up proper for its native son, the revolutionary hero. I missed the parades of the military and the school children this year as I was at my short story discussion group, but I did attend a free outdoor evening concert. As I sat enjoying the classical music provided by an excellent army orchestra numbering about 50, with a chorus of about 20, I was wearing only a light jacket. I recalled the many layers I had to wear this time last year, not to mention socks, heavy scarf and gloves, as the weather then was most un-seasonably cold. 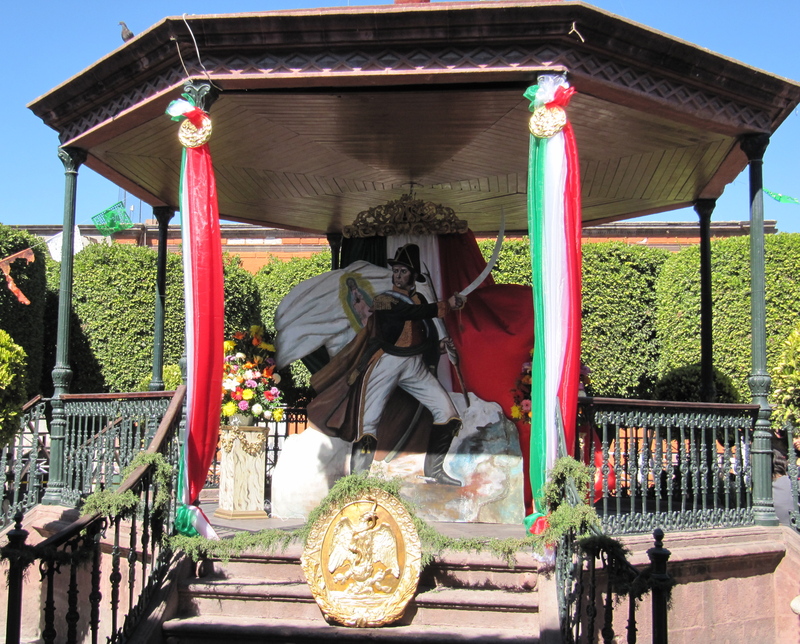 An homage to Allende set up in the gazebo in the jardin (where the crèche scene had been a month earlier).